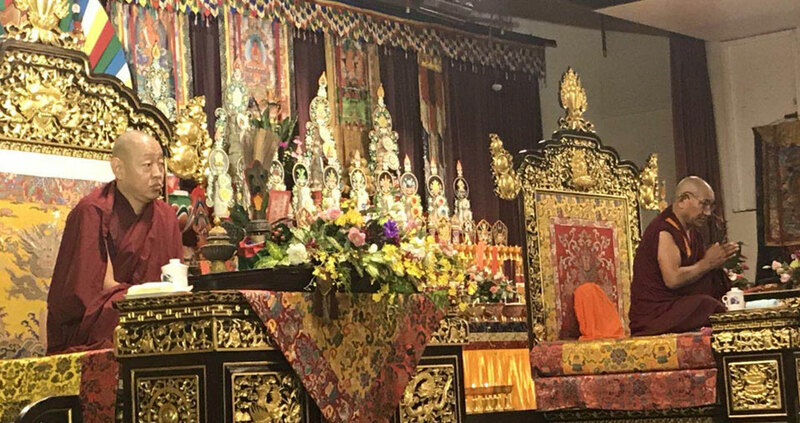 Due to the efforts and teachings of the great Mahaguru Padmasambhava, Buddhism flourished in Tibet beginning in the 8th century. 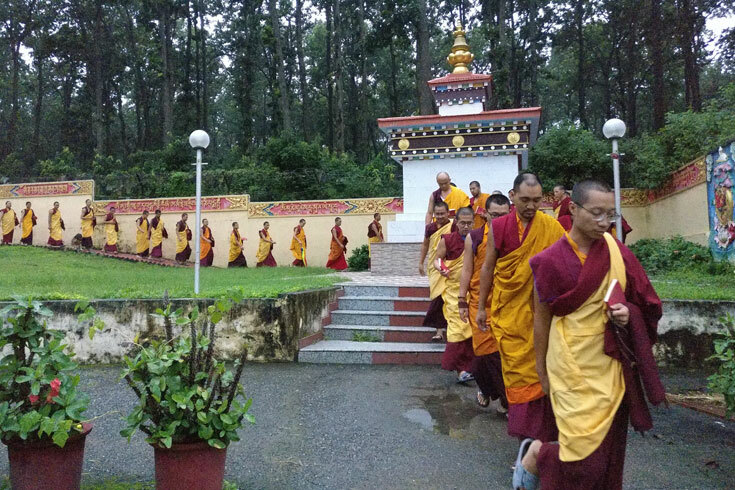 Of the four main schools that developed, the oldest is the Nyingma or the Old Translation School. 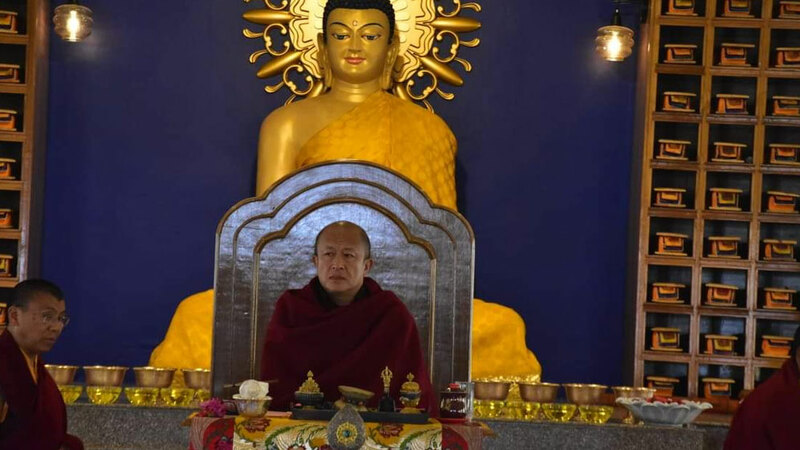 The Kagyu, Sakya and Gelug lineages comprise the Sarma or New Translation School.The essence of the Nyingma lineage is the precious Dzogchen teachings, the most ancient, powerful and direct teachings of Tibetan Buddhism. 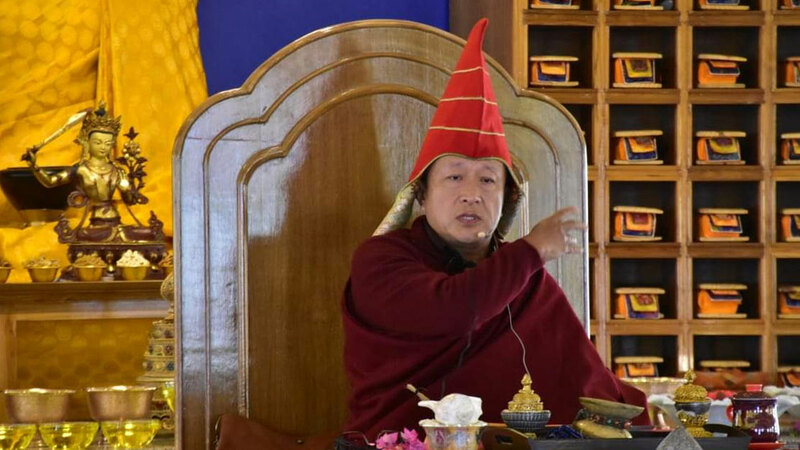 For today’s troubled world, these teachings are the clearest and most effective way to realize one’s full potential as a human being. 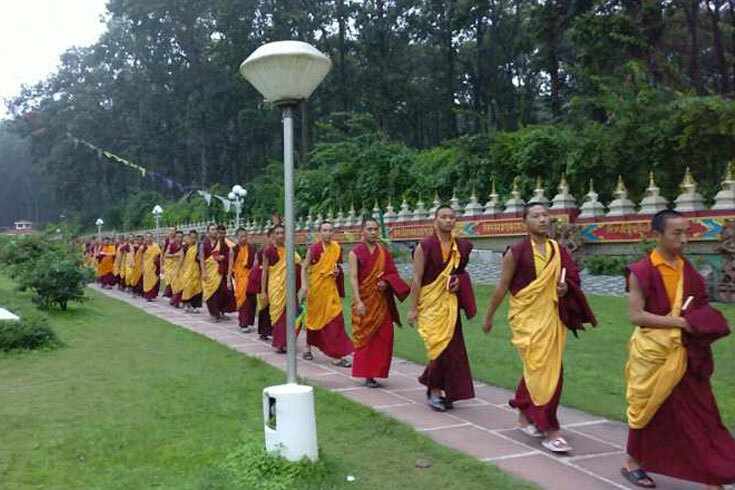 The Nyingmapa or Nyingma School has six main monasteries of learning and practice. 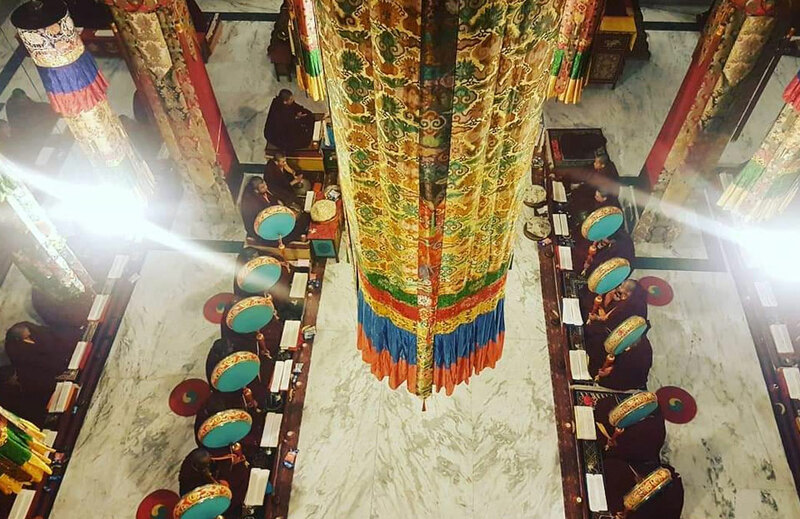 Of the six, Mindrolling is one of the largest and most important practice and study centers in Central Tibet. 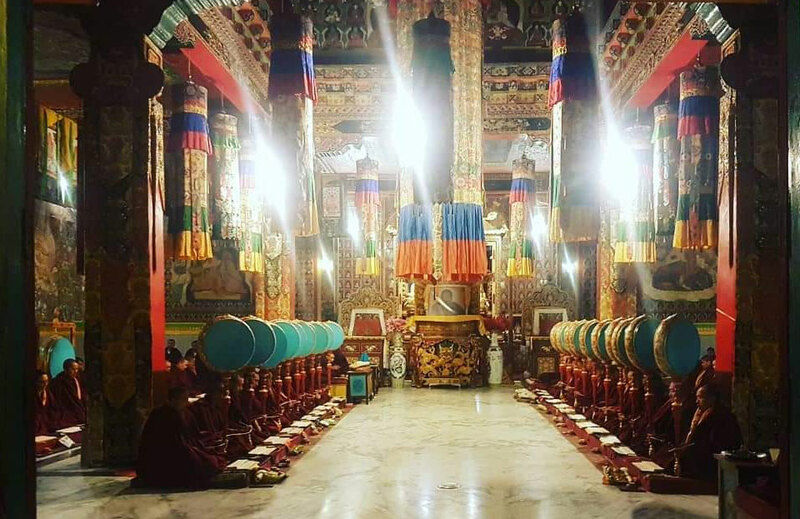 Since its establishment in 1676 by the great Dharma King Chogyal Terdag Lingpa, Mindrolling has attracted monks from the length and breadth of Tibet. 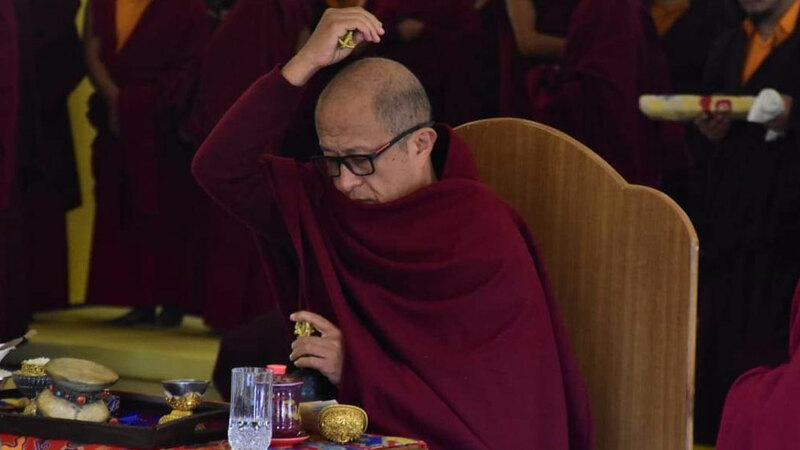 Mindrolling is considered by all the great masters of Tibetan Buddhism, and especially by all the teachers of the Nyingma lineage as an inspiring example of practicing the pure and profound Dharma of Vajrayana Buddhism. 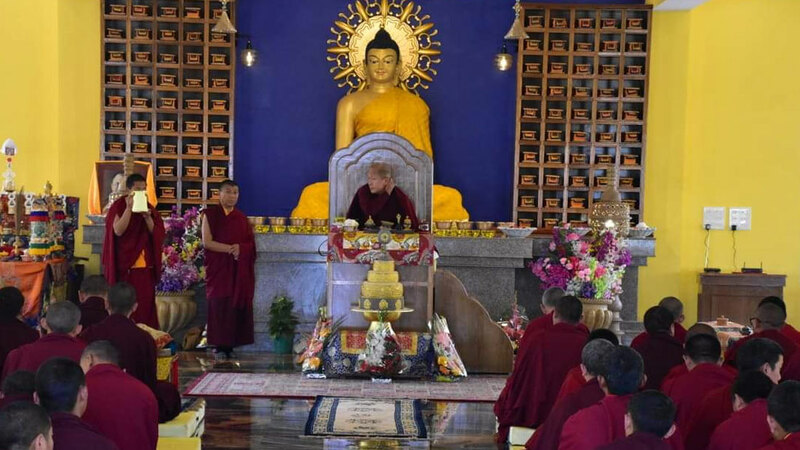 An unbroken lineage of great masters continues up to this day and Mindrolling is known throughout the Dharma world, both as the lineage and monastery dedicated completely to Dharma activities and as a main center for maintaining the precious secret Vajrayana Doctrined. 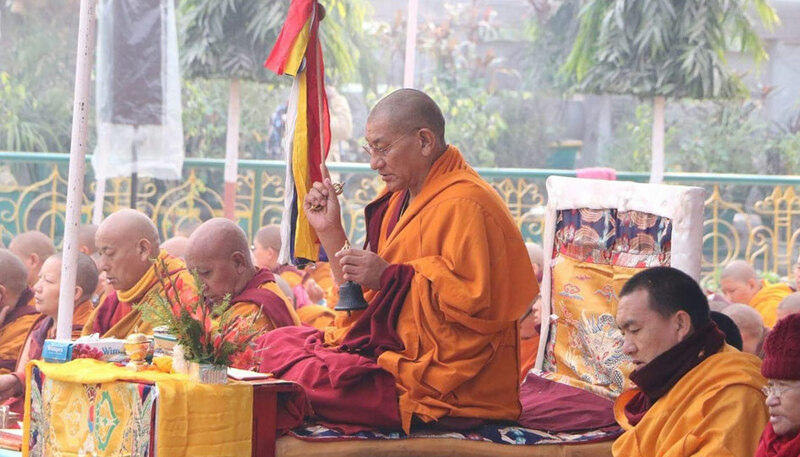 30th Annual Ngagyur Nyingma Monlam Chenmo at Bodhgaya will begin from 6th Jan, 2019 for ten days. 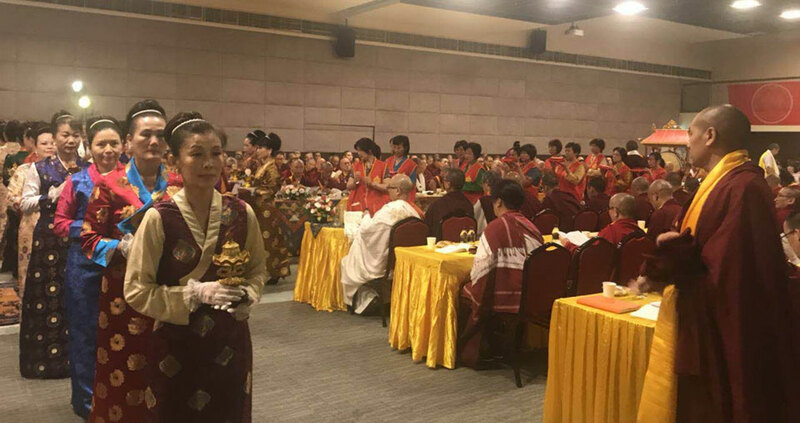 This year is the third year of His Eminence Minlling Khenchen Rinpoche’s responsibility as a President of Ngagyur Nyingma Monlam Chenmo International Foundation. 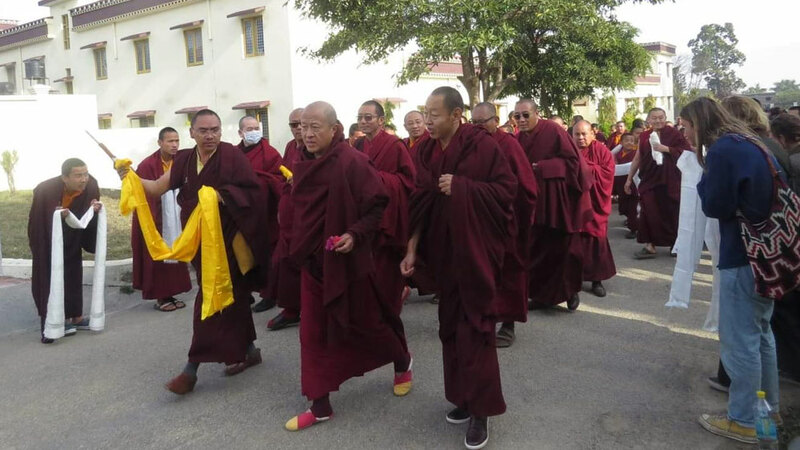 A dream come true for Mindrolling Sangha this year that the (Non secterian master of all the time) His Eminence Kyabjey Dzongsar Jamyang Khyentse Rinpoche visited Mindroling Monastery. 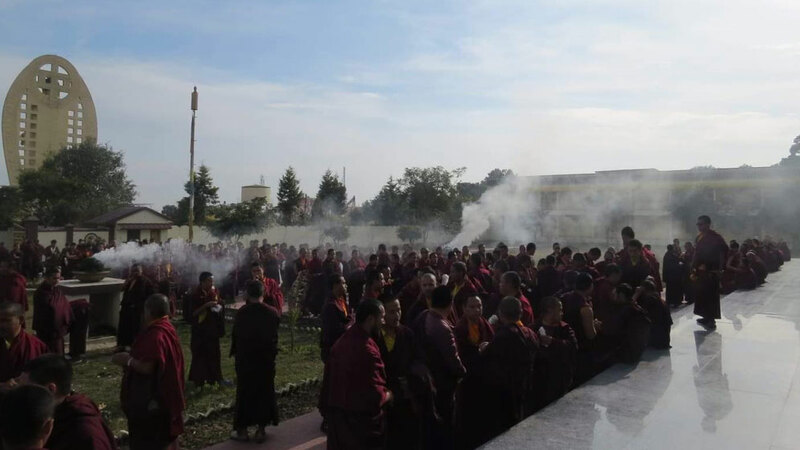 Mindroling Monastery didn’t celebrated the Lunar New year or Losar (Earth Pig) as a solace and respect for the sudden loss of His Holiness Kathok Getse Rinpoche. 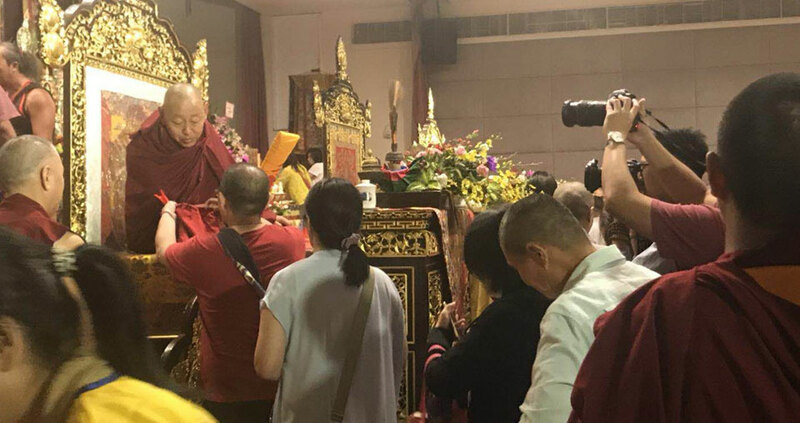 It was the personal wish of his Eminence Minlling Khenchen Rinpoche and the Mindrolling Sangha to have Rinpoche’s blessings at the same time, it so happened that His Eminence DJKR also wished to attend the Thukjecchenpo Great accomplishment to commamorate the Maha Peri-Nirvana of Minlling Thri Rinpoche Gyurmey Kunzang Wangyal. 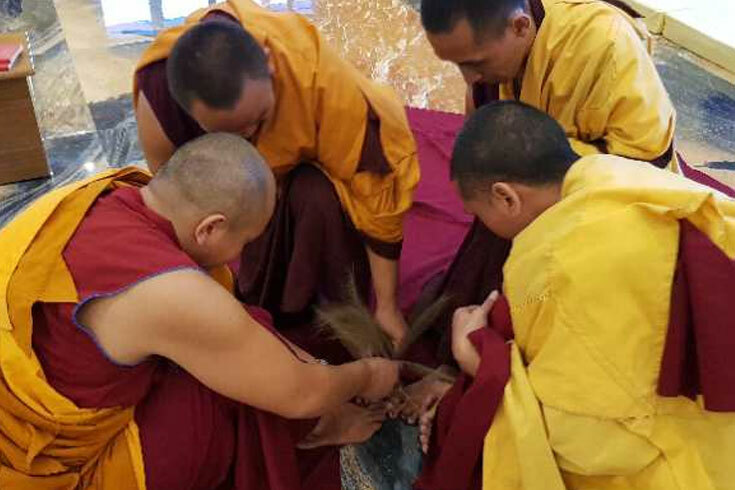 Thus, the fulfilment of wishes from both side auspiously occurred. 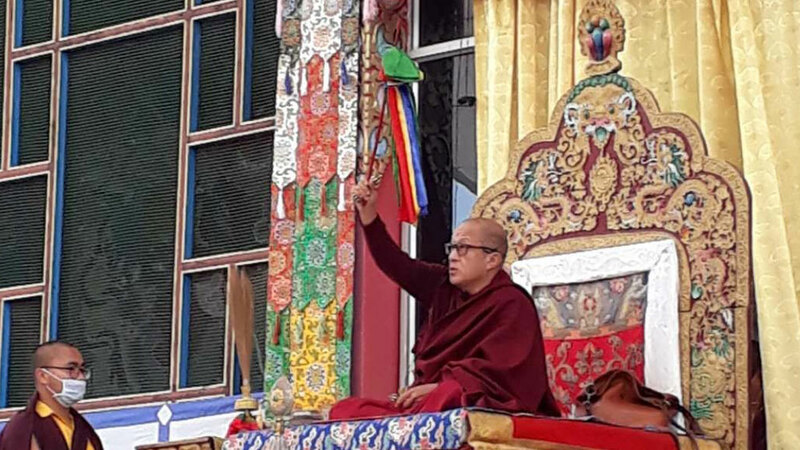 His Eminence DJKR bestowed Long Life Empowerment for Mindrolling Sangha and General Public on 10th Feb as a New year blessings and Manjushri Enpowerment for the Teachers and Student of Ngagyur Nyingma College. 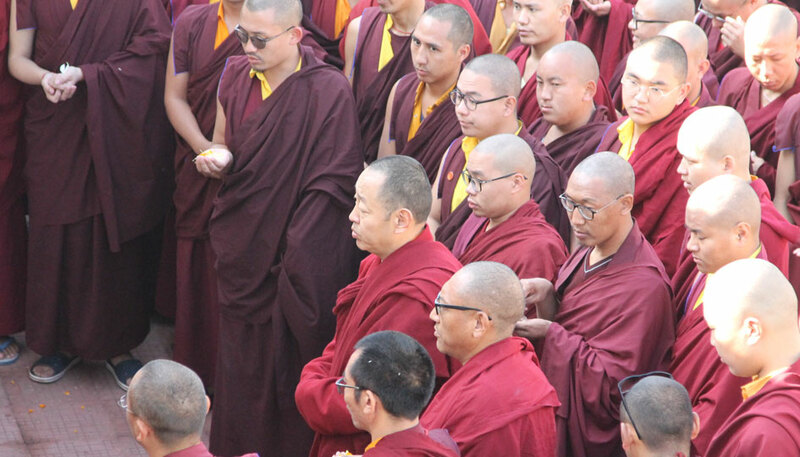 Rinpoche will make his presence throughout the Tbukjechenpo great accomplishment which will take place for one week. 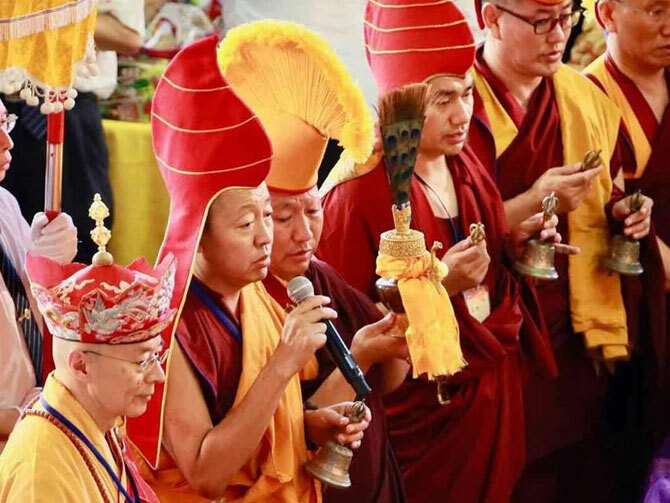 The rich and supreme traditions of Mindrolling include Drubchens (Sadhana/accomplishment) held annually as per the precious instruction of Terdak Lingpa, Mindrolling Sangha has again assembled in the right place and time to initiate the Drubchen of Shinjey for many significant purposes that it has stood for eversince its first kind. 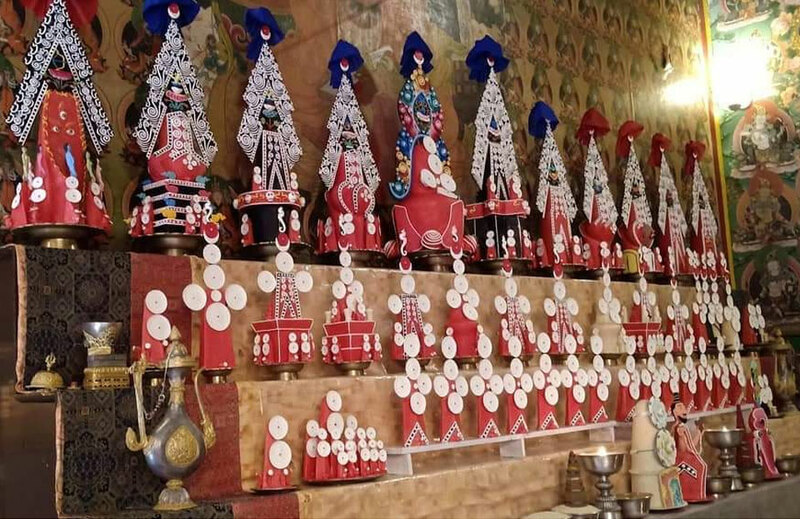 This year the drubchen will be held from 28th of Jan and will end on 3rd of Feb. Shinjey/Yamantaka is the lord of death and often considered to be the wrathful expression of Manjusri by the Buddhists. 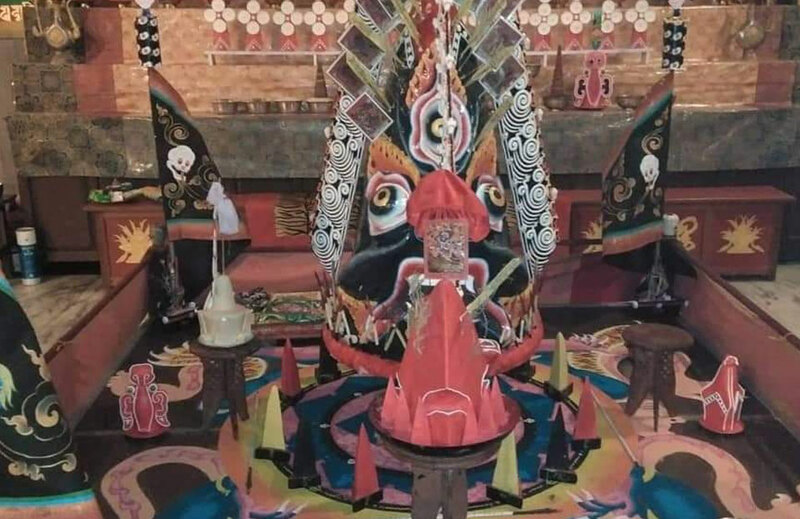 Yamantaka is a Sanskrit name that can be broken down into two primary elements: Yama, the name of the god of death; and antaka, making an end. Thus, Yamantaka means “Destroyer of Death” or “Conqueror of Death”. 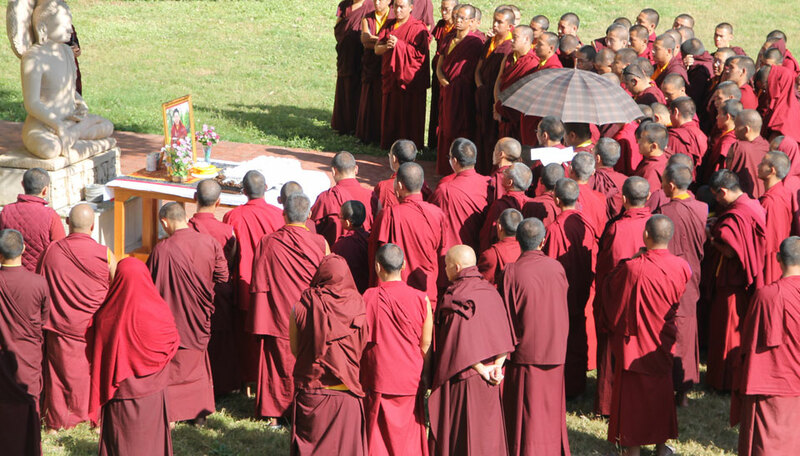 Within Buddhism, “terminating death” is a quality of all buddhas as they have stopped the cycle of rebirth, samsara. 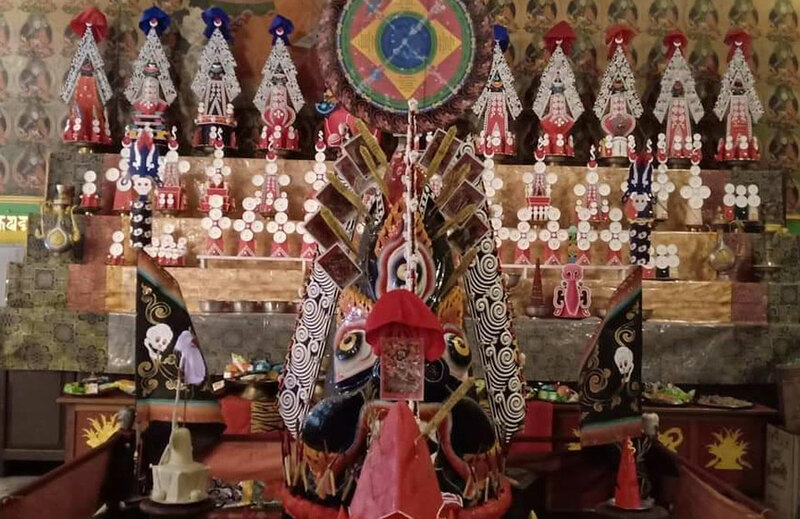 Yamantaka, then, represents the goal of the Mahayana practitioner’s journey to enlightenment, or the journey itself: in awakening, one adopts the practice of Yamantaka, the practice of terminating death. 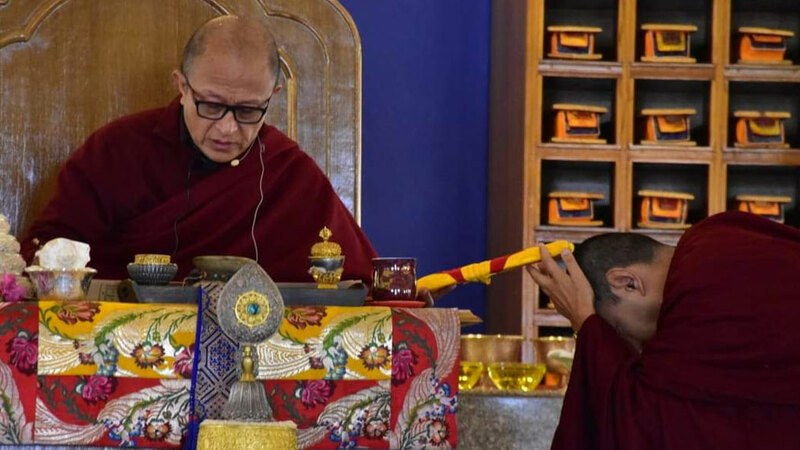 Guru Yoga Chant by His Eminence 9th Minlling Khenchen Rinpoche for one of the devoted disciple of HH the late Drupwang Penor Rinpoche. The record was of 16 years ago. 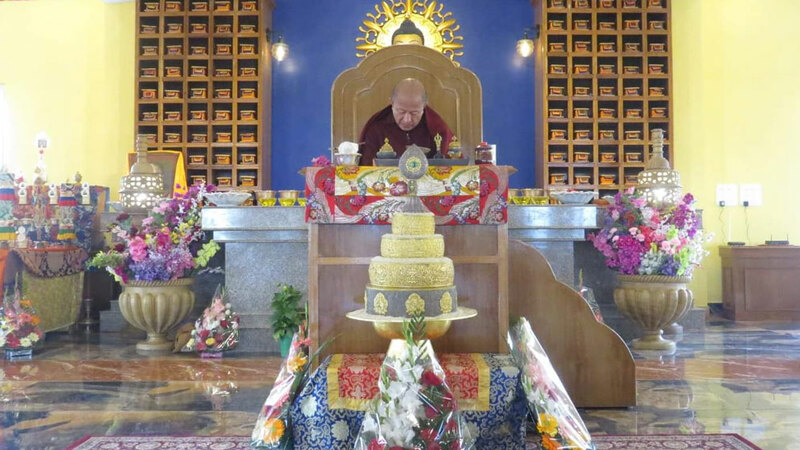 May the teachings of Lotus born one spread to all the directions. 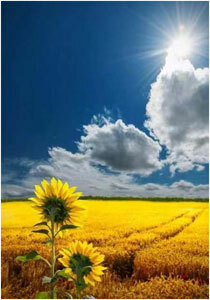 Above all, making your life meaningful asper your own capabilities is most important. 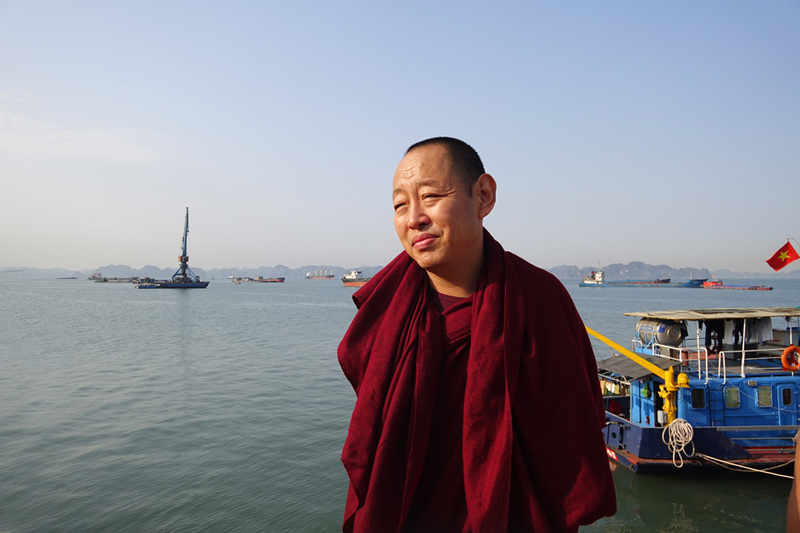 Since all phenomena are interdependent, everything will fall apart one or the other day. 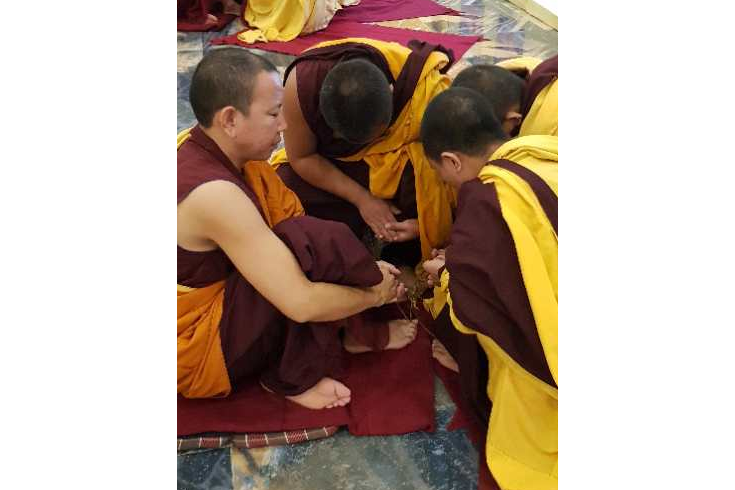 Therefore, keeping in mind the holy teachings of Buddha and bringing it to daily practices is what we all as his followers have to stick on. Irrespective of age, gender and cast, by and by we all will meet the big enemy called death, and regretting about life that you have lived at the dead bed is the most foolish thing to do. So, promise to your own self to make use of 2019 in a very effective way. Happy New Year to all of you. 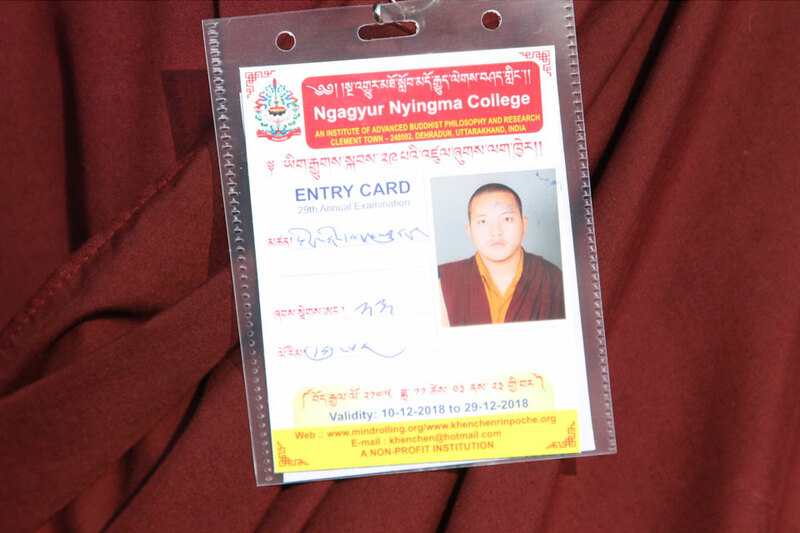 The examination Committee has announced the exam dates a month ago and STUDENTS were not only busy doing thier own self studies but also issued the entry card and index number today. 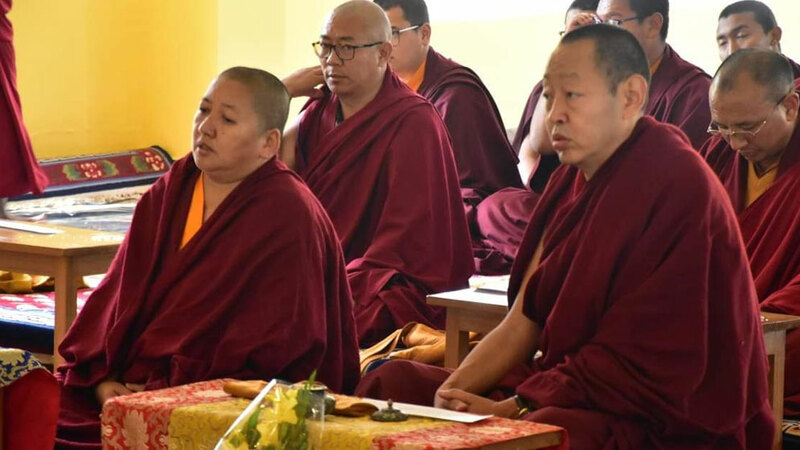 The exam suppervisor Khenpo Tenzin Gyurme and his friends Lopon Ngawang Thekchok and Lopon Ugyen Tshering are now ready with all preparations. The first exam begins from 10th of Dec and completes on 29th Dec 2018. Wish you all a Good Luck. 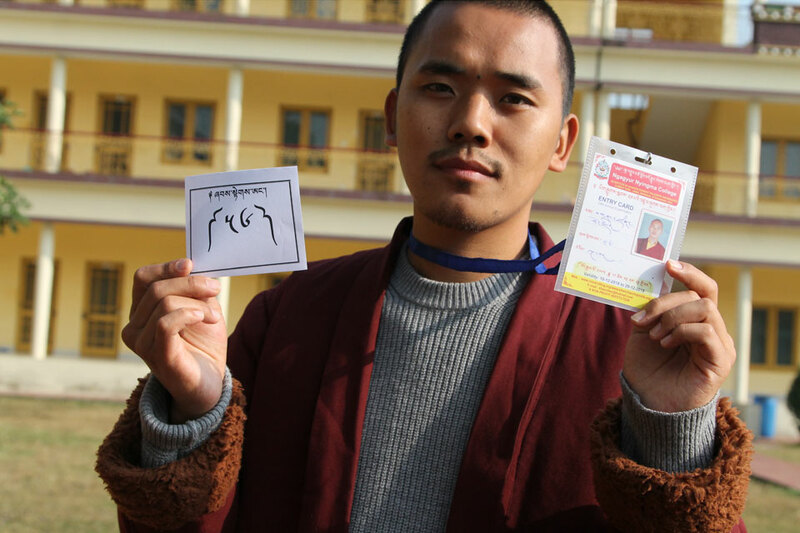 A dream come true for NNC. 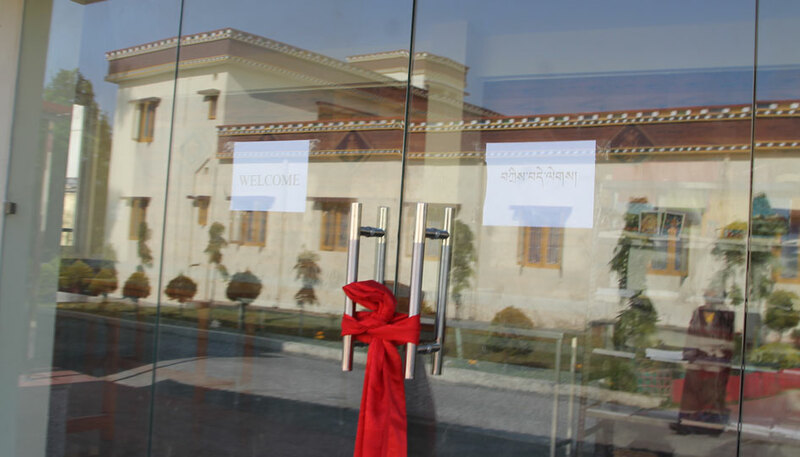 Ngagyur Nyingma College had a long time dream of having a coffee cafe in the COLLEGE and it is Inaugurated today. 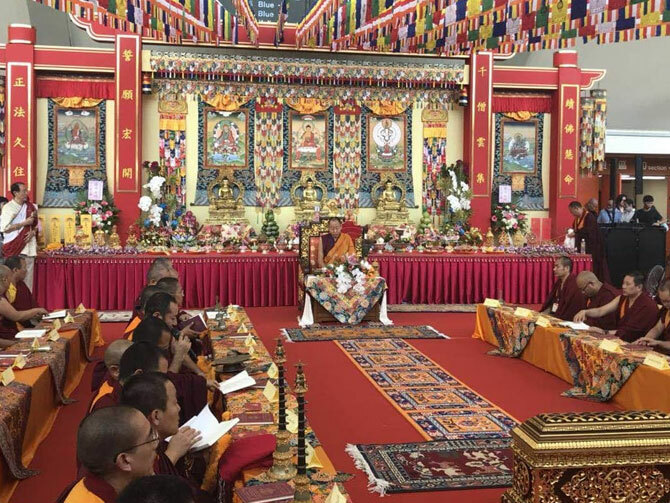 The hard work and dedication put forward by the team along with chairman Khenpo Karma, Vice Chairman Khenpo soanm, Chief clerk lopon Tshering Phuntsho, cafe manager Zhenphen Thaye and Dechen are all appreciated. 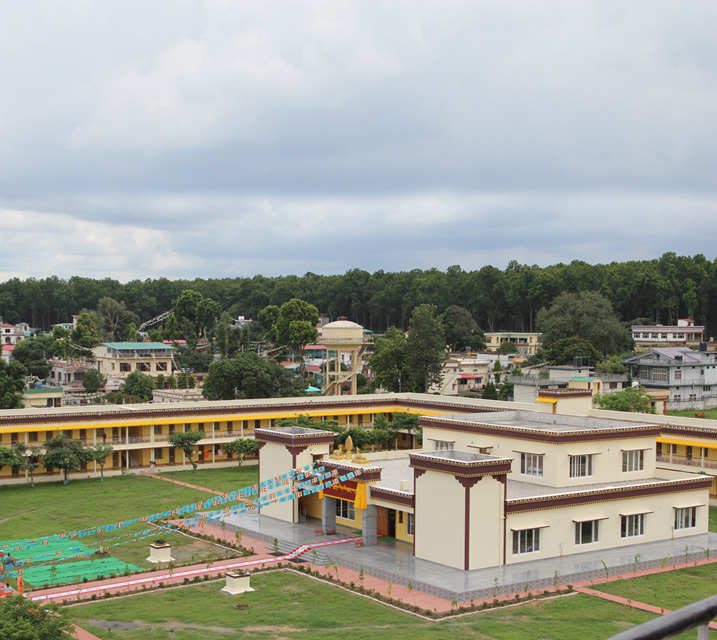 Along with it, the team has also come up with new office of the administration with all necessary facilities. Deep appreciation for the great job. 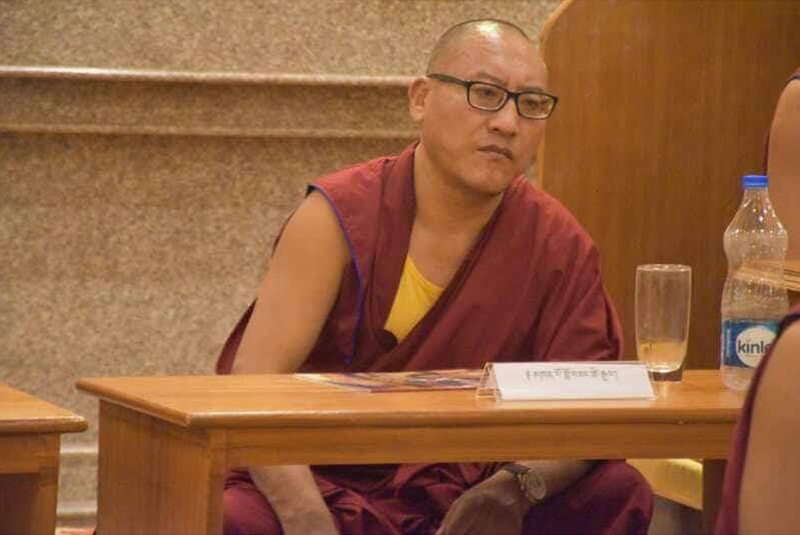 Dungsay Dalha Gyaltsen, the son of His Holiness Mindrolling Trichen and Yum Sonam-la (his mother), was born in Tibet in 1959 while His Holiness was in the Gesar retreat, so he was named Dalha Gyaltsen. 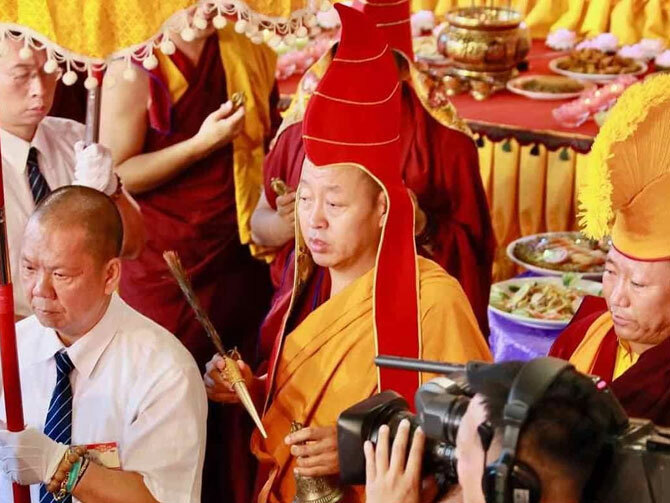 When His Holiness had to flee Tibet due to the Chinese invasion, Yum Sonam-la and the young Dungsay Dalha Gyalsten were unfortunately not able to flee with His Holiness. 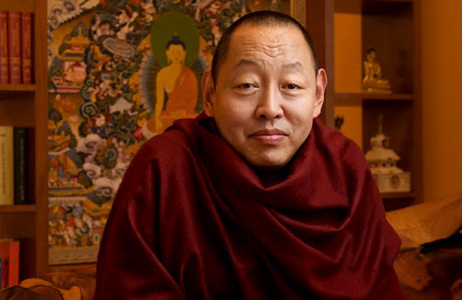 While growing up in Tibet, Dungsay Rinpoche studied under many qualified Teachers and his interests included Tibetan medicine. 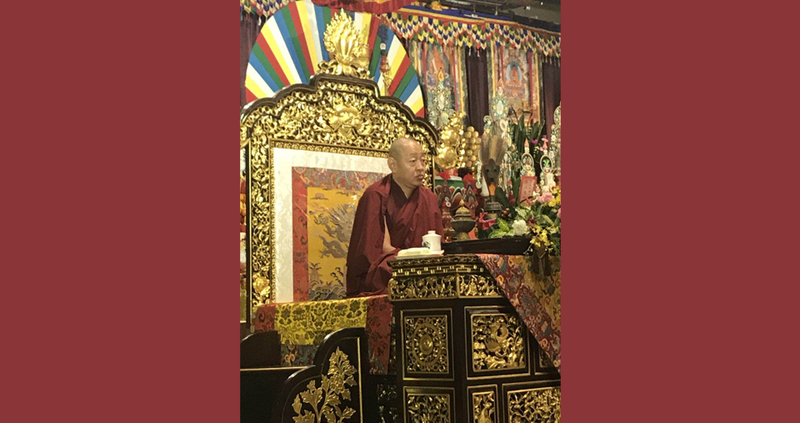 Years later, Dungsay Rinpoche traveled to Mindrolling Monastery in India and received numerous teachings and transmissions from some of the most accomplished great masters of that time. 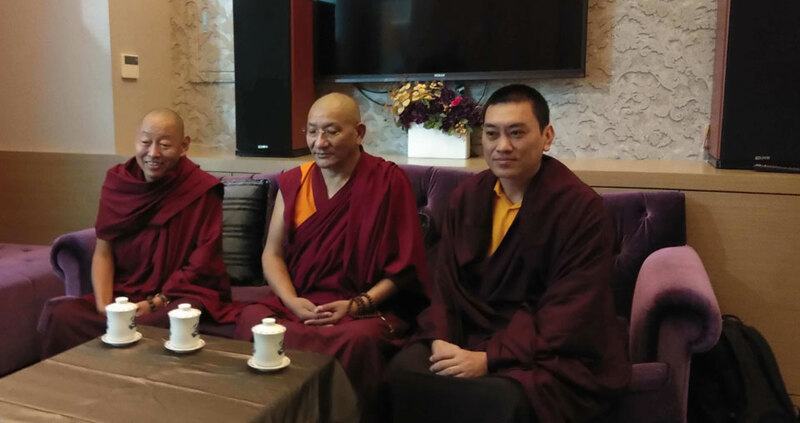 These included His Holiness Mindrolling Trichen, His Holiness Dilgo Khyenste Rinpoche, His Holiness Penor Rinpoche, His Holiness Trulshig Rinpoche and Khenpo Jigme Phuntsok. 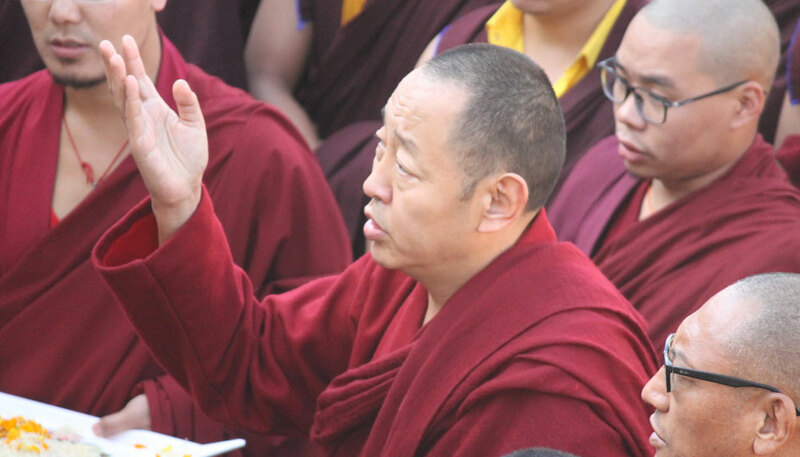 Dungsay Rinpoche resides in Tibet where he returned after studying in India for many years. 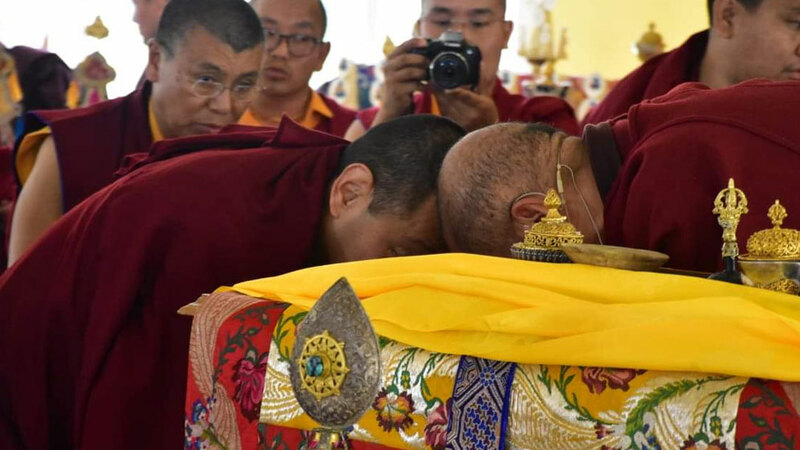 On this occasion, I join all the well wishers including Sangha of Mindroling monastery in India, Tibet and other places in praying and offering our humble wishes for Rinpoche’s long and healthy Life. 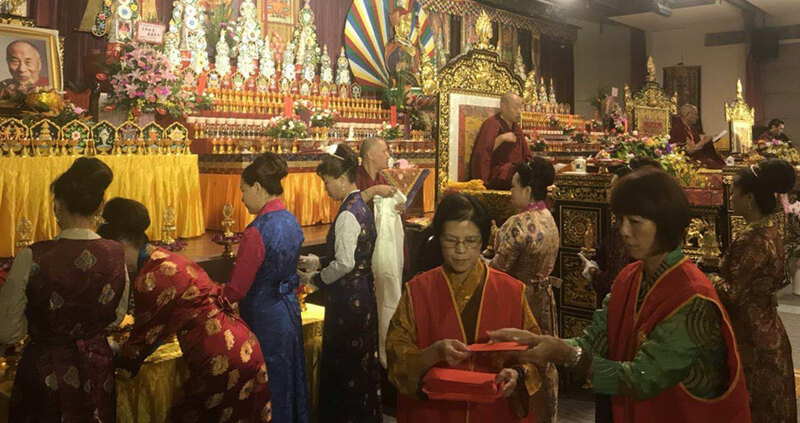 May Rinpoches activities outreach all directions for all time to come and continue to bless endless sentient beings for all the time. 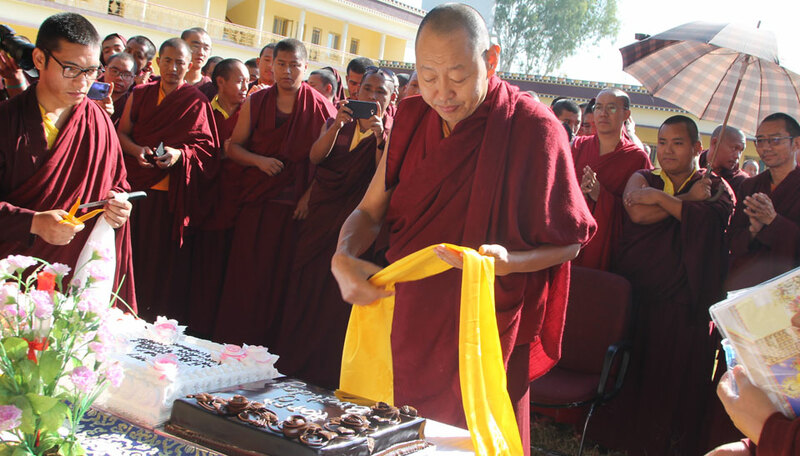 Happy birth day, Your Holiness. 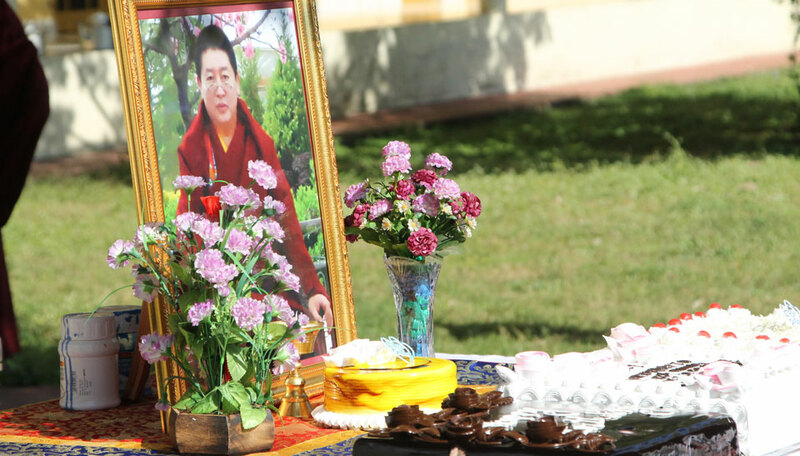 Commemorating the Birth of Great soul. 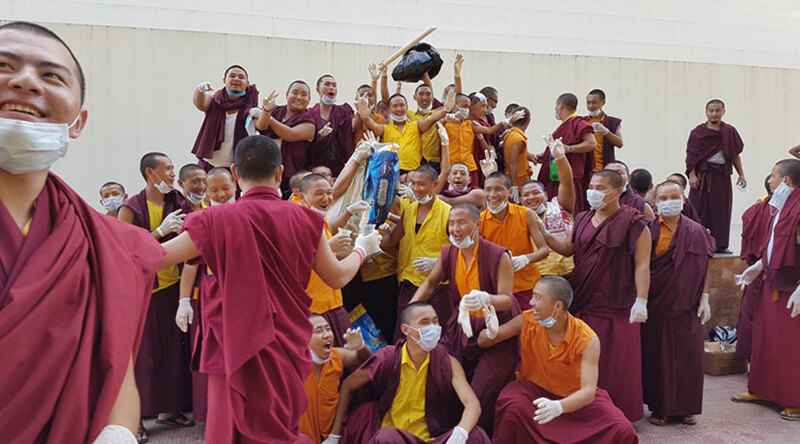 The community of Dhondupling Settlement and monks of Mindroling Monastery, Ngagyur Nyingma College joined the Nation in its mission called Clean a India. Mahatma Gandhi’s birth day being remembered in special way. 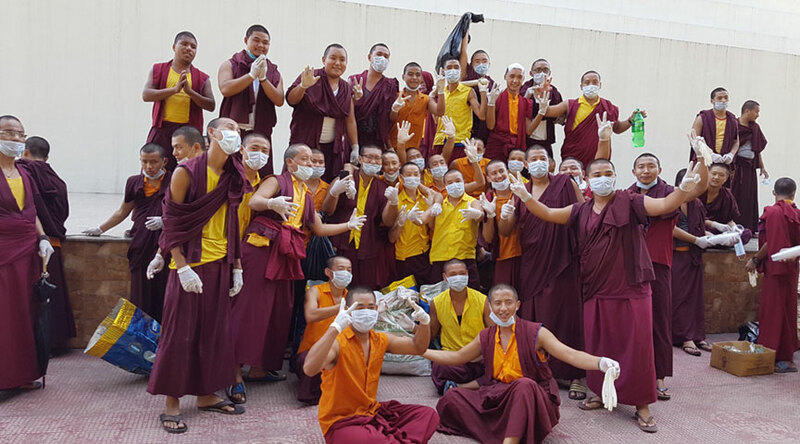 As recommended from the desk of Chairmanof the Shedra, monks made a detailed round of monastery campus and surroundings leaving not the tiniest trash. 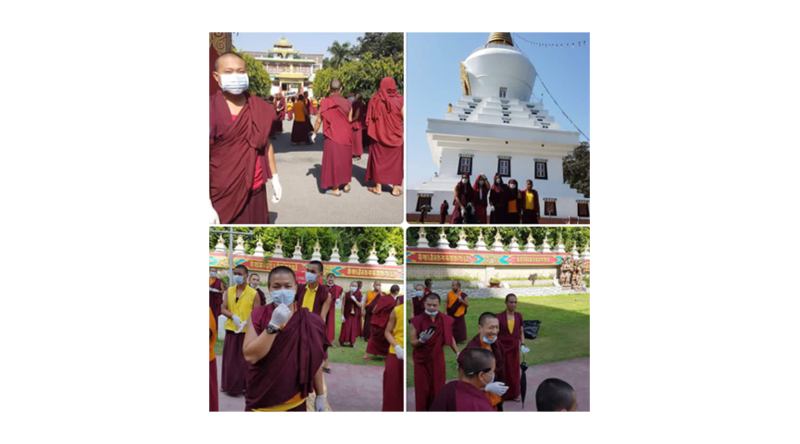 Keeping clean, outside,Inside and clean within is what we as a Buddhist believe in strongly. 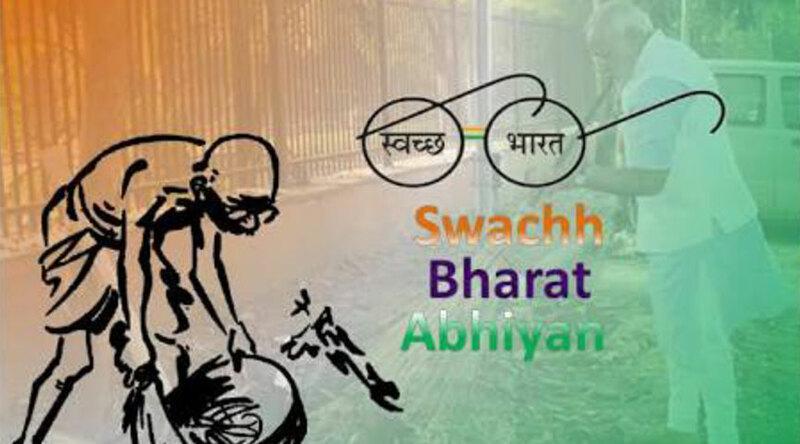 May India remain Clean and pristine for all times to Come. 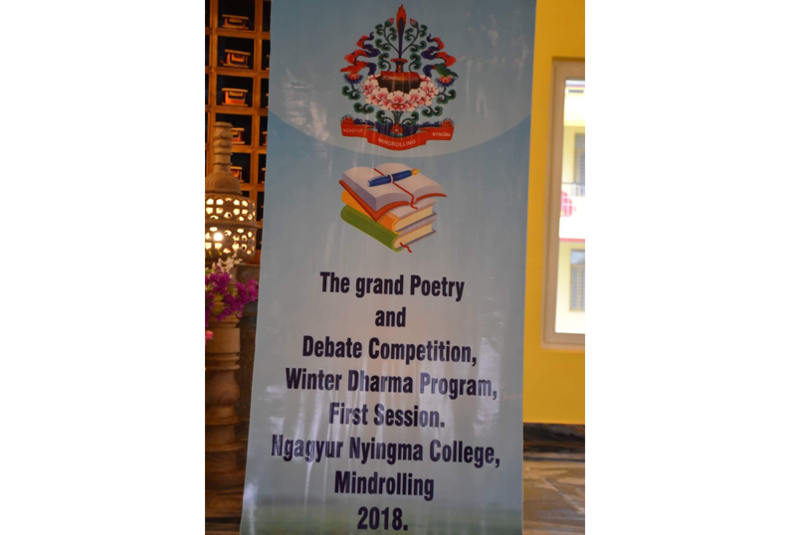 NNC, under Mindrolling Monastery has been trying its best to improve the skill among the students in the fields of debate, composition and expounding as the root of all the learning. The 2018 administration has come up with the new idea this time to give different taste of participation among the students. 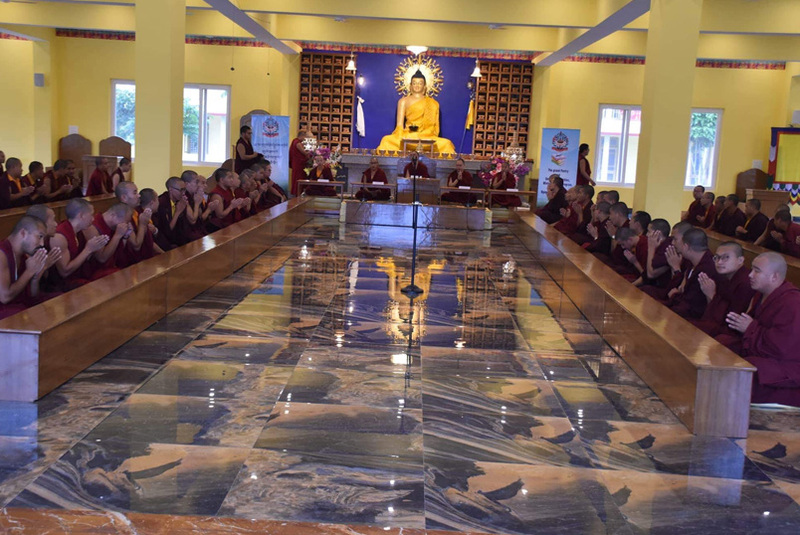 Whole Shedra students are divided into eight groups where each group will compete on same topic and final two groups will be chosen for the desired prize and certificates. 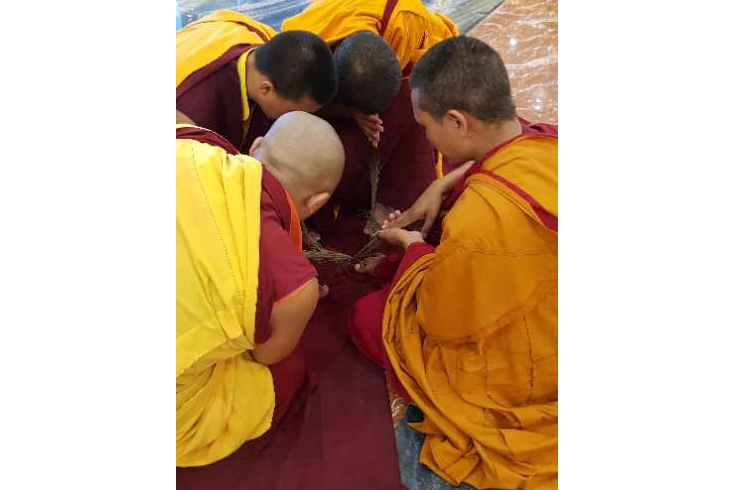 The students are well aware that the prize and certificate are secondary to the wisdom they will gain from the program. 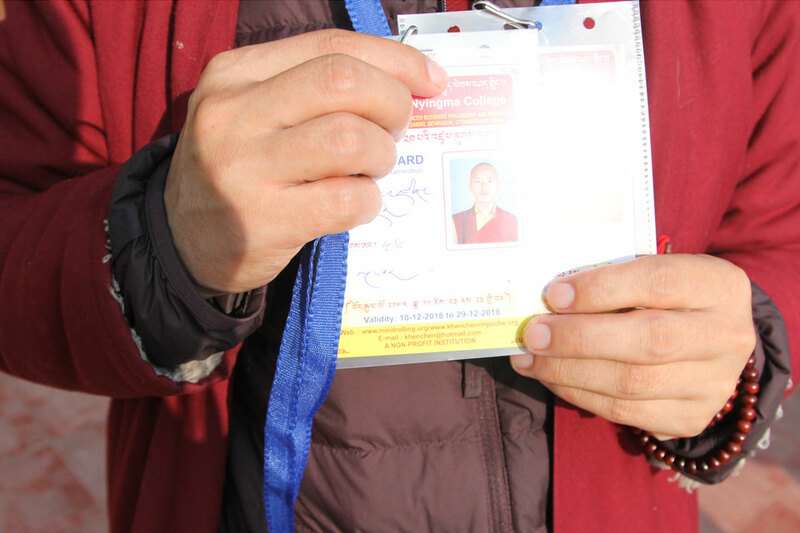 The NNC aspires for this kind of program be always initiated in future too. 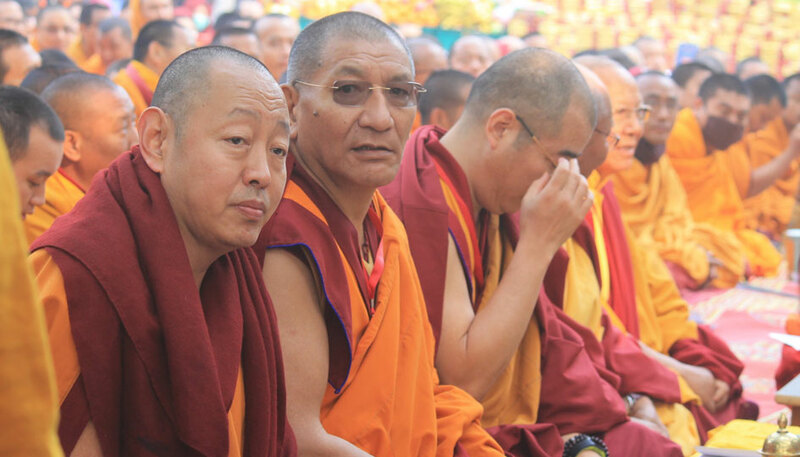 May the Hearing and Releasing teachings of Buddha be always victorious in the three realms. 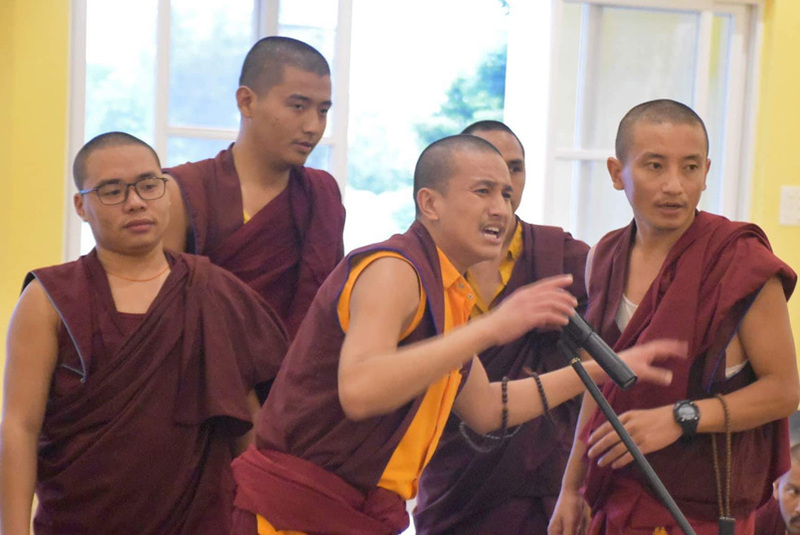 Monks undertake Summer Retreat in order to purify and strengthen their precepts. 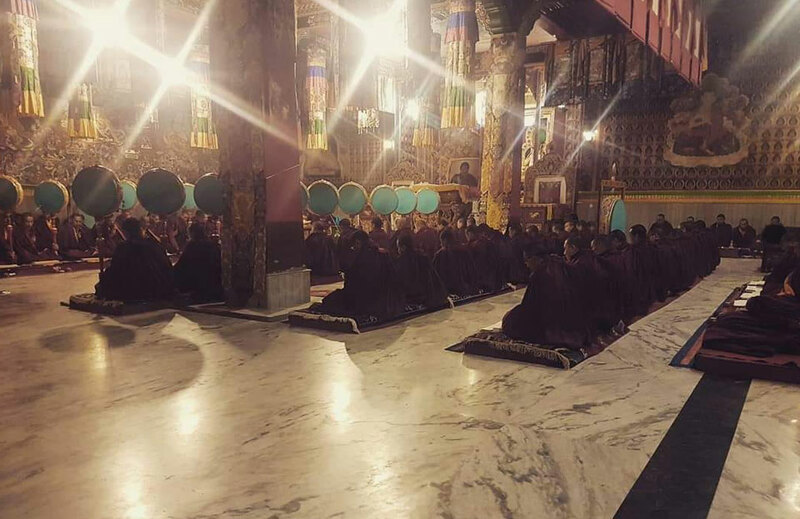 It is held every year for a month and half starting from 15th of 6th month of Tibetan calendar till the end of 7th month. 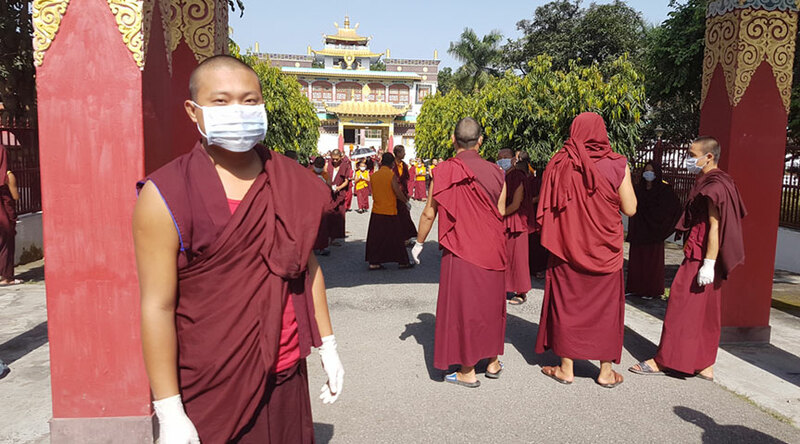 It is held so that the monks can minimize the chances of harming creatures and even humans knowingly or unknowingly. 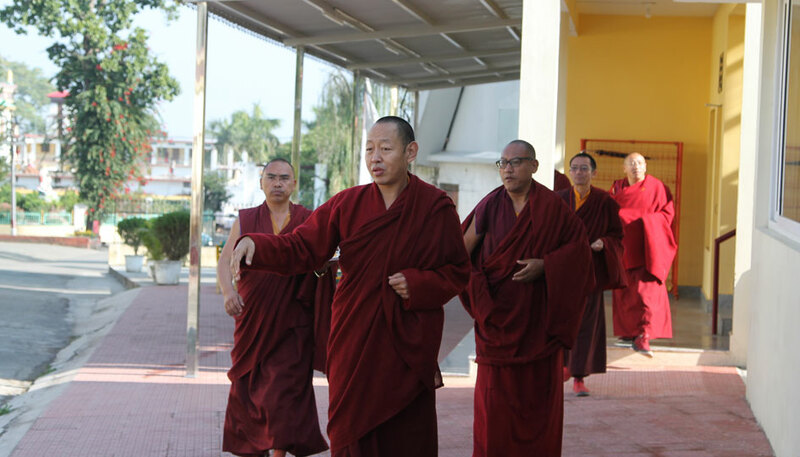 Staying in summer retreat also help monks accomplish virtues and wholesome tasks easily and minimize tragedies that occur to them when going outside. 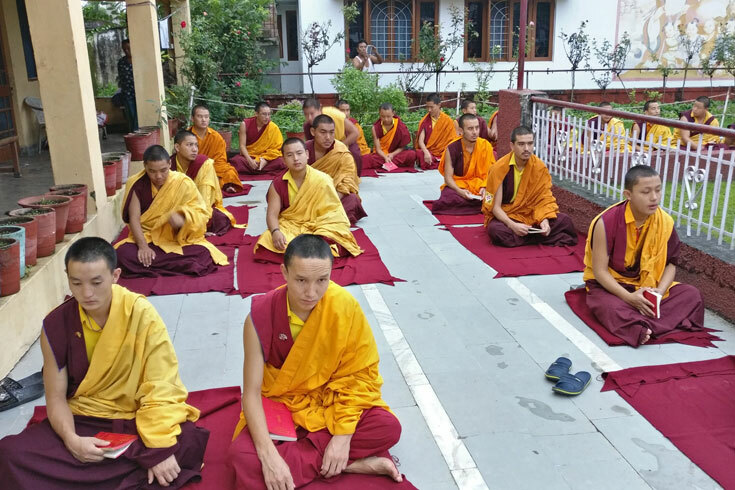 They are left with less activities whereby providing them plenty of time to study and practice. 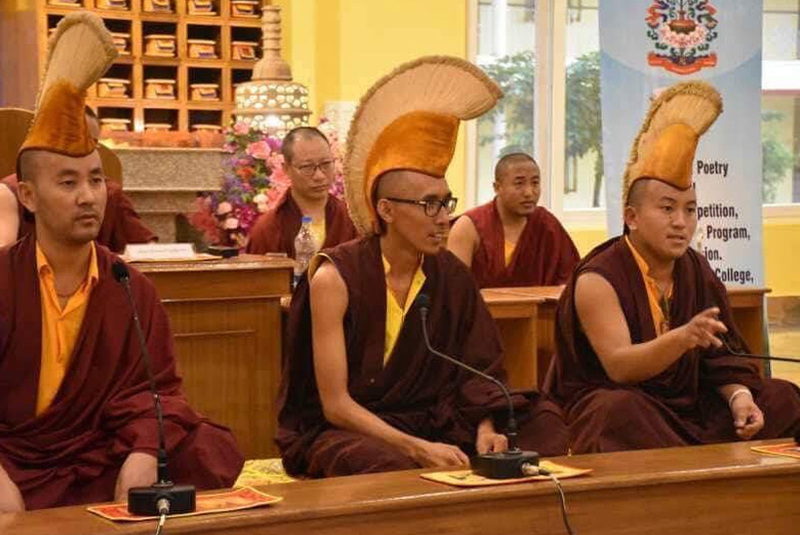 It also acts as a bridge to connect to much more precepts of a monk that they should follow. 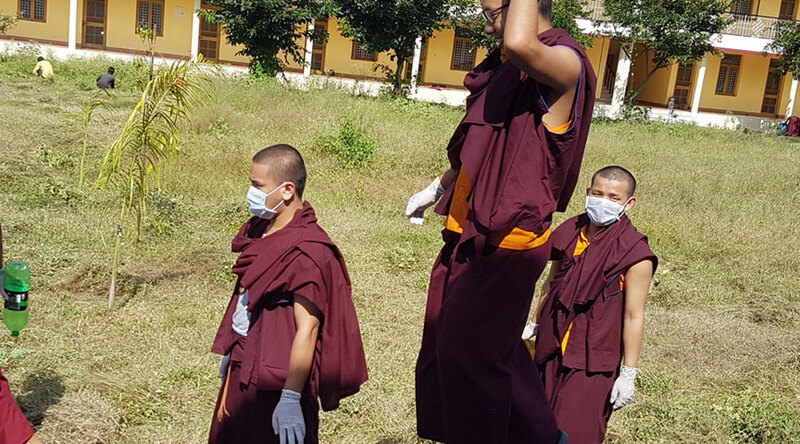 As the name suggest, it is a ceremony that monks undergo right after summer retreat where they are lifted away from those extra restrictions that were imposed on them to follow while in the retreat. 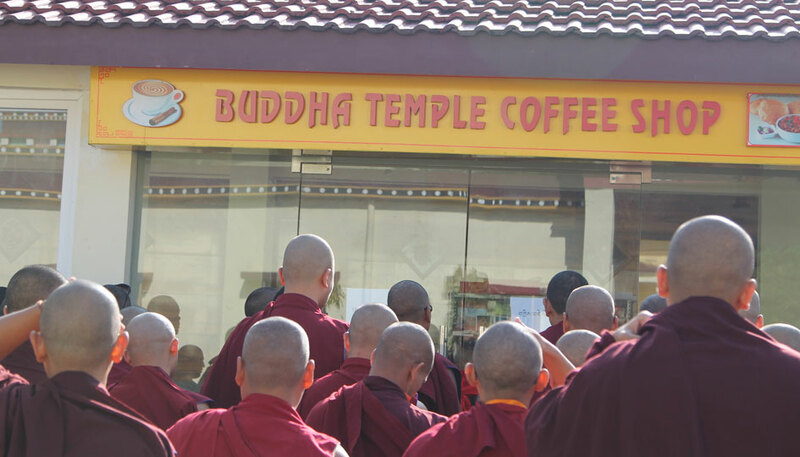 It is somewhat like a reward for staying in the retreat. 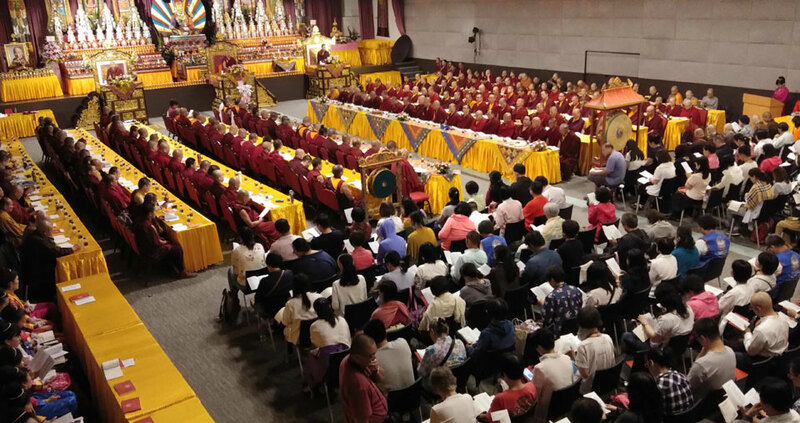 His Holiness Minlling Khenchen Rinpoche attended the Grand Annual World Peace ceremony at Taipei, organised by Chung Hwa International Buddhist Association and Sangha Offering Group on 2nd Sept, 2018. 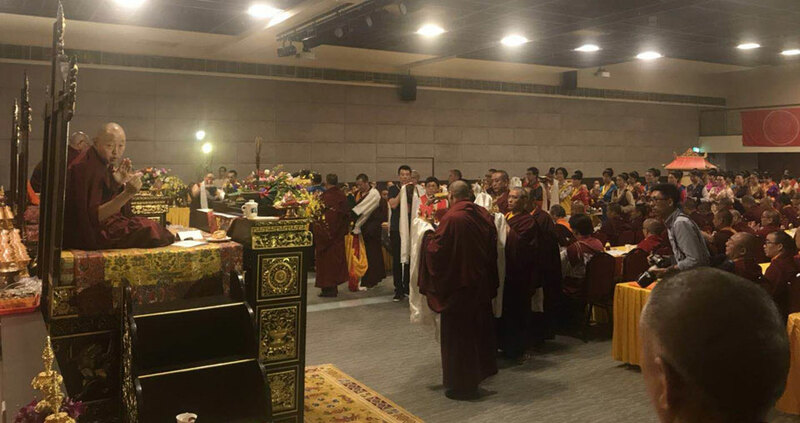 Along with the religious head from Buddhist Countries like Great China, Veitnam, Myanmar, Singapore and so on, His Holiness led the prayers as and ceremonies as requested by organisers. 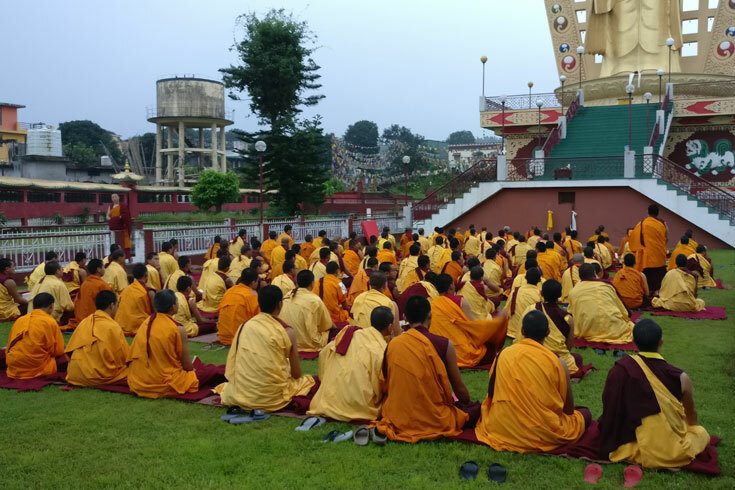 The ceremony dedicated for the peace and prosperity of the world began with prayers in the morning with all the Sangha and Lay practitioners. 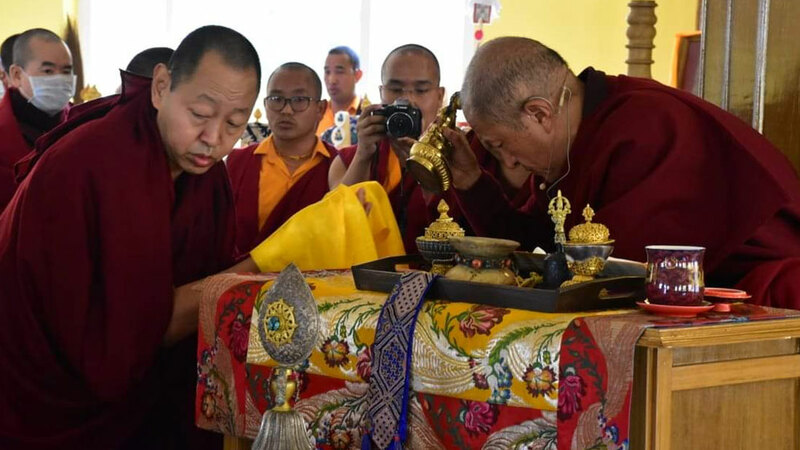 Rinpoche led the liberating rituals as per the liturgy of "THUKJE CHENPO DUK-NGA RANGDROL" (avaloketeshvara natural freedom from five poison) in the afternoon. 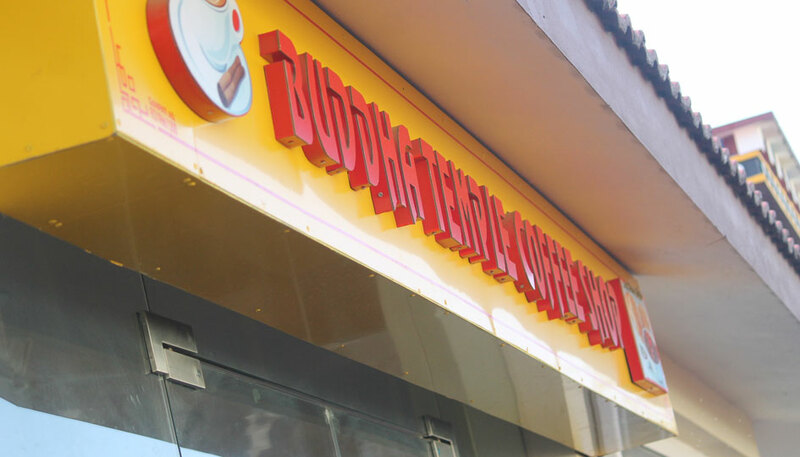 May Buddha Dharma florish forever. 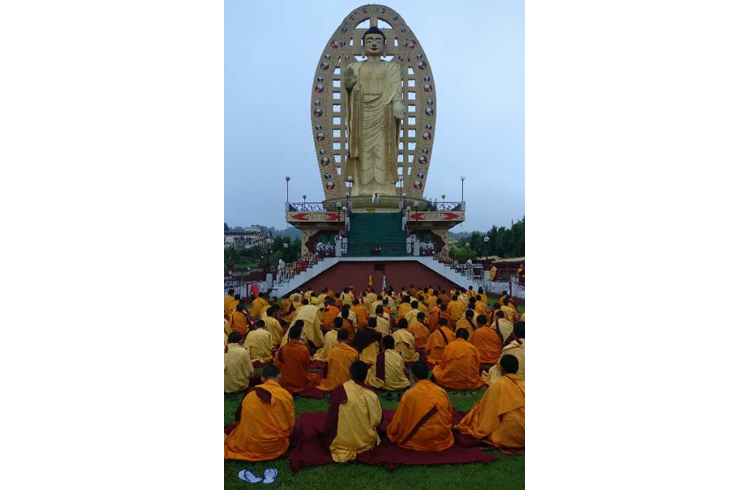 The Taiwan Ngagyur Nyingma Monlam Ceremony which was held on 18thAugust 2018. 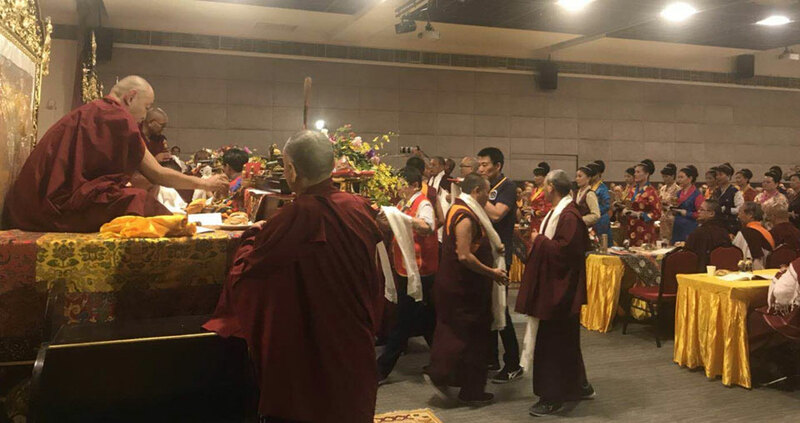 His Eminence 9th Minlling Khenchen Rinpoche along with 7thsuprem head of Ngagyur Nyingmapa, His Holiness Kathok Getse Rinpoche and His Eminence Muksang Kuchen Rinpoche graced the prayer along with hundreds of Sangha and thousands of devotees. 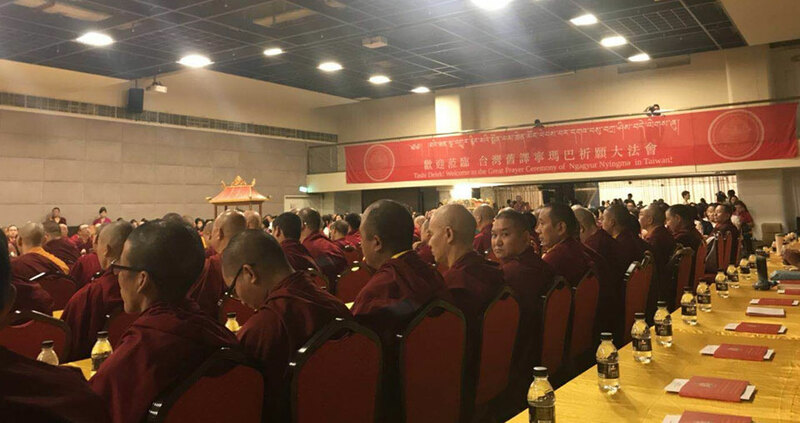 The prayer is conducted for the peace and prosperity of people at Taiwan and for the whole sentient beings as the main practice of Buddha’s heart teachings. 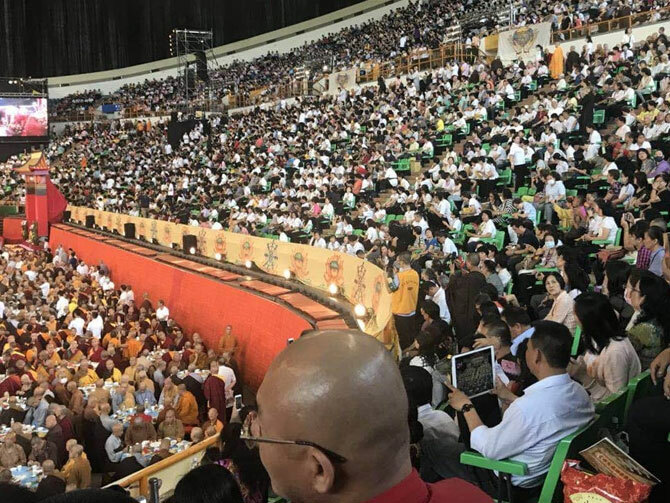 In the short speech, Rinpoche mentioned about how the great merit and opportunity that this ceremony has brought all together in the history of Taiwan Buddhist. And that all gathered are for the purpose of accomplishing two accumulations. 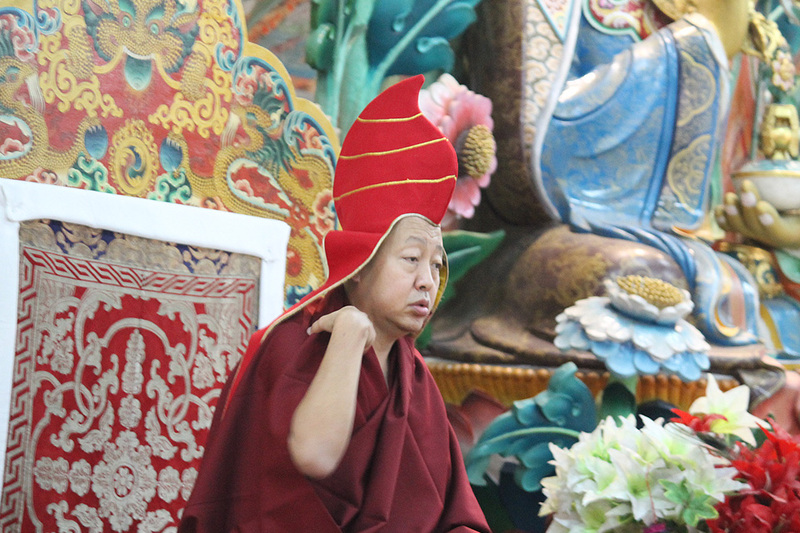 Rinpoche expressed his heartfelt gratitude to everyone for this grand ceremony. 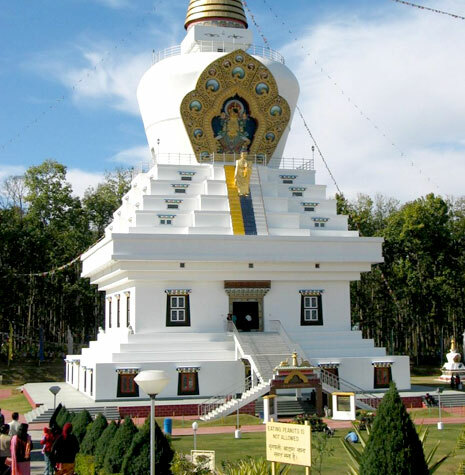 We are all gathered here solely because of our faith and devotion towards Buddha and to his marvellous teaching. 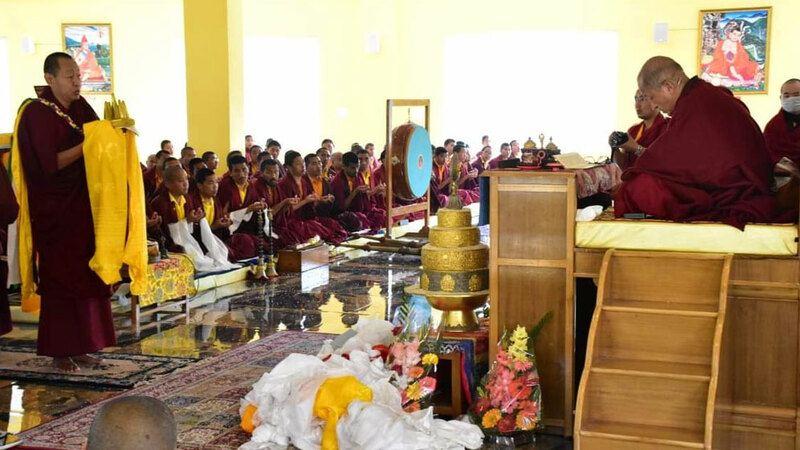 The main objective of college is to educate students with the teachings of Sutra and Tantra and ways to put them into practice. 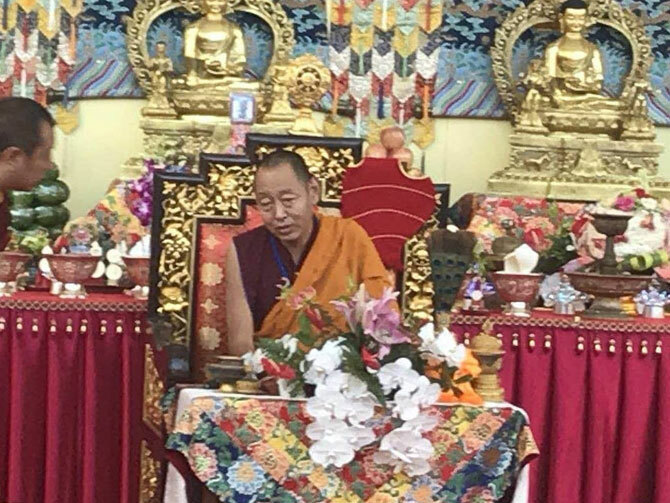 Moreover, to fulfil the aims and views of His Eminence Minlling Khenchen Rinpoche, from simple way of living to positive thinking and emphasis on developing good and compassionate heart and particularly looking more ways to propagate Buddha’s teaching to help appease this turbulent world. 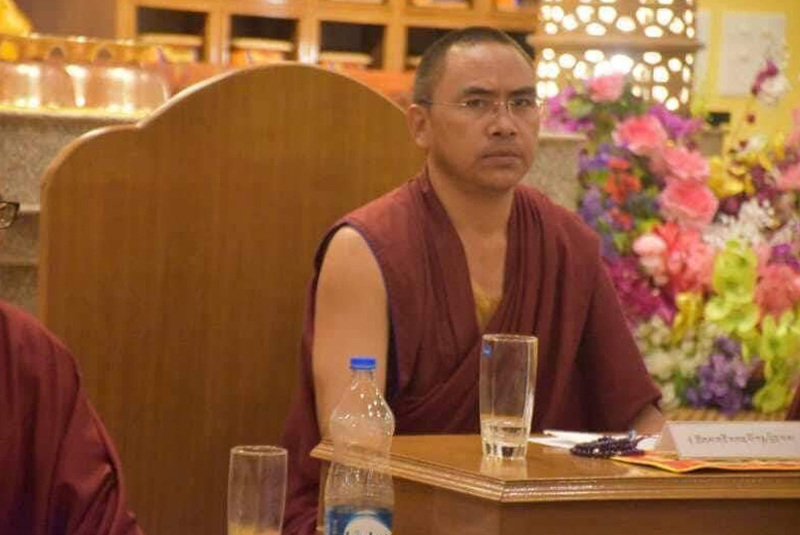 His Eminence MinllingKhenchen Rinpoche has, therefore, taken up great responsibility with intense hardship to bring this into reality and many devoted sponsors has supported him wholeheartedly. 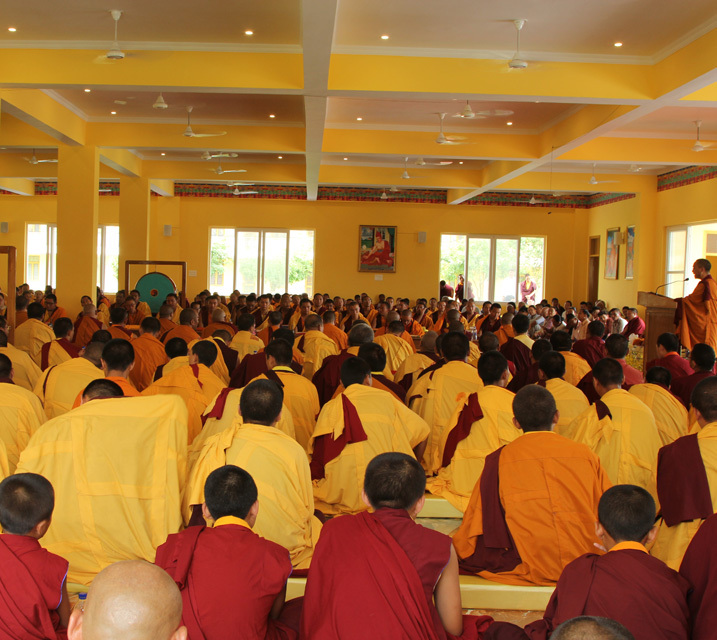 Today you all witness the completion of NgagyurNyingma College’s new Shrine Hall and library with necessary facilities. 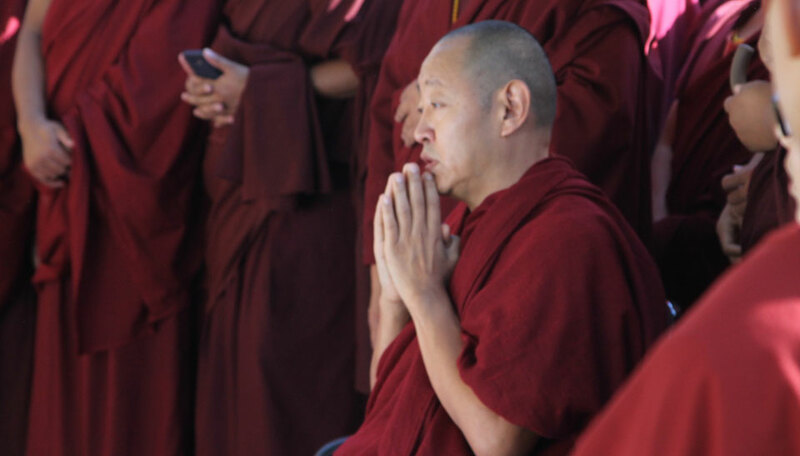 With great determination and hardship, Rinpoche has managed to complete it in couple of years. 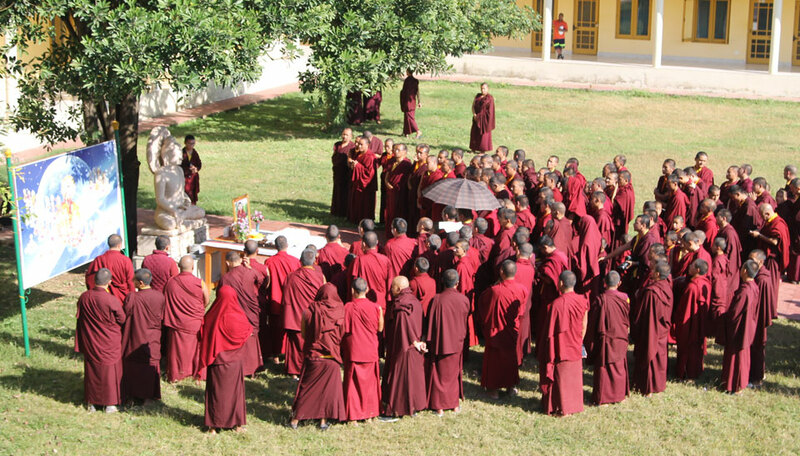 Since from 1988 April 26th, NgagyurNyingma college has given 700 Buddhist students, 200 graduates and 43 khanpos. 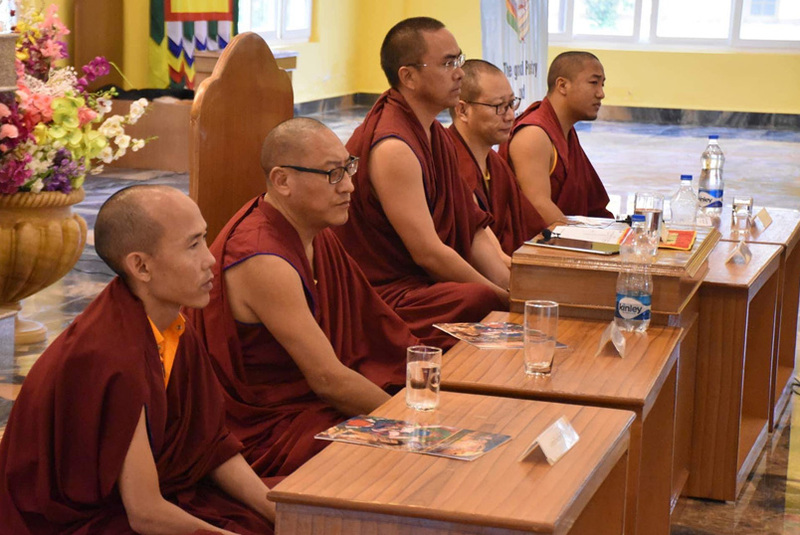 At present most of the khenpos and graduates are giving their teaching service in the different monasteries in different parts of Bhutan, Nepal and India as required. 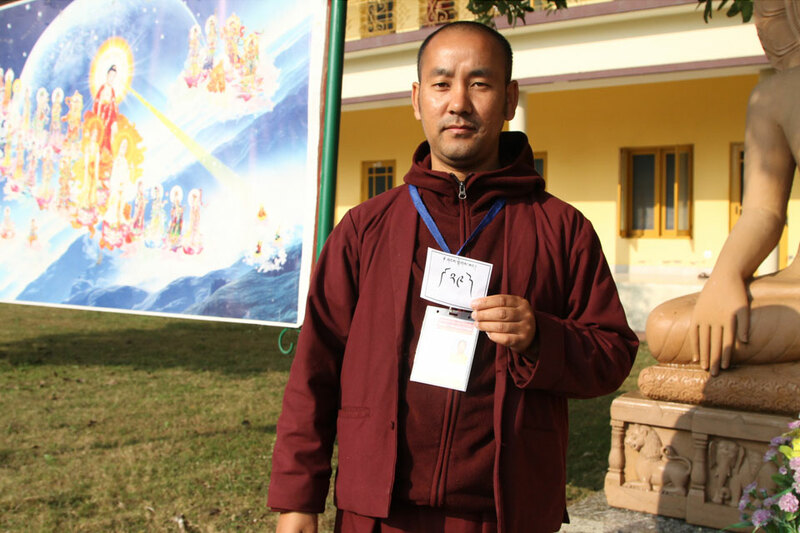 This year alone,our Teachers and Khenpos are serving in 24 different Monasteries beyond the borders. 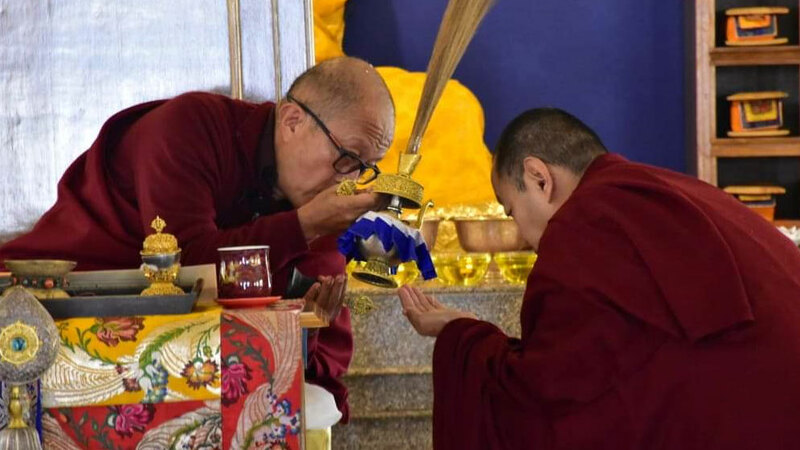 And looking into future how best we can benefit all sentient beings through our little ways. 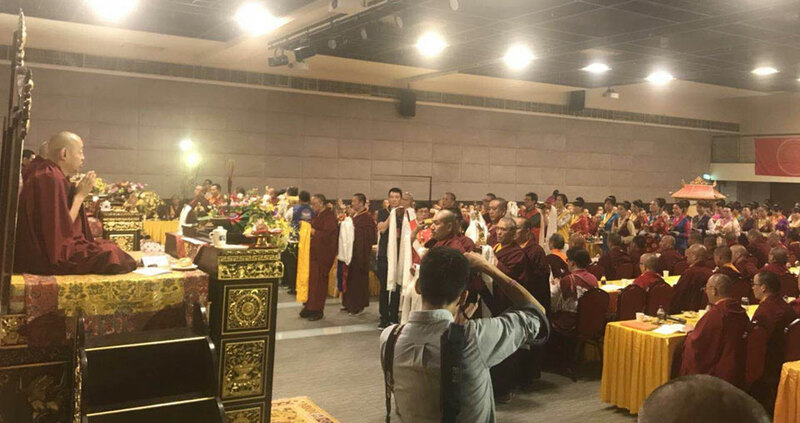 Finally I conclude by thanking His Eminence MinllingKhenchen Rinpoche for his tremendous effort and all the sponsors for their dedicated support. 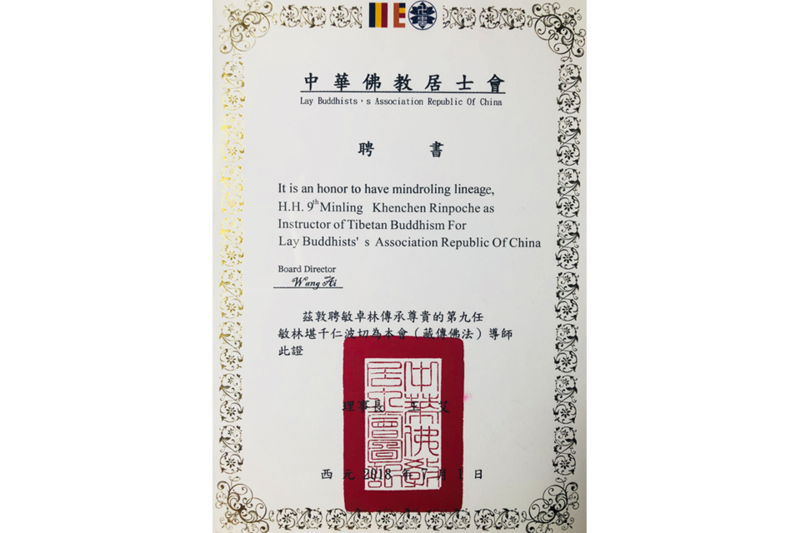 Lay Buddhist’s Association was founded in 1968 with its ambition to help the communities in the fields of health and education, awareness of healthy life and support to those youths who are under influence of drugs abuse around the globe. 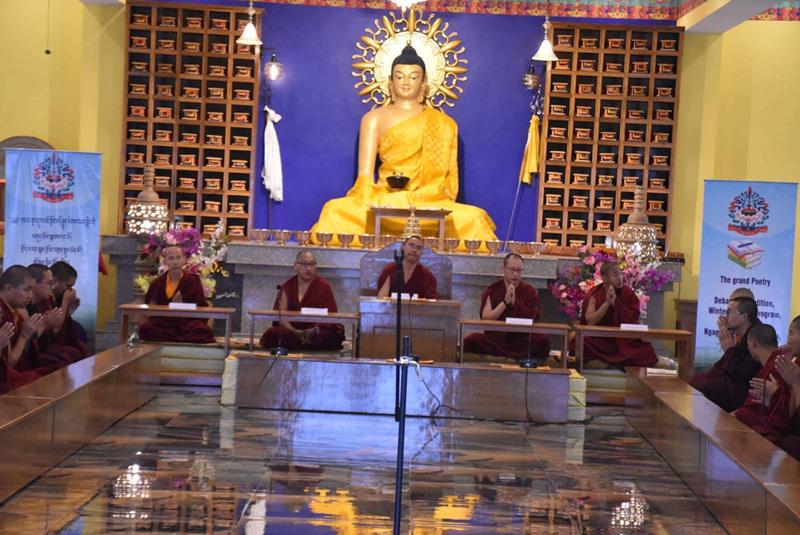 It also functions as a major forum of discussion about Buddhist principles and values of Mahayana Buddhism. 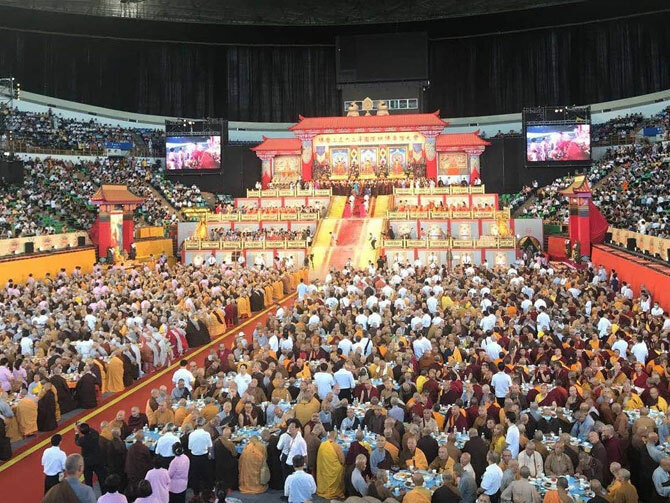 The lay Buddhist associations now have more than 5000 participants including members and staff from Great China. 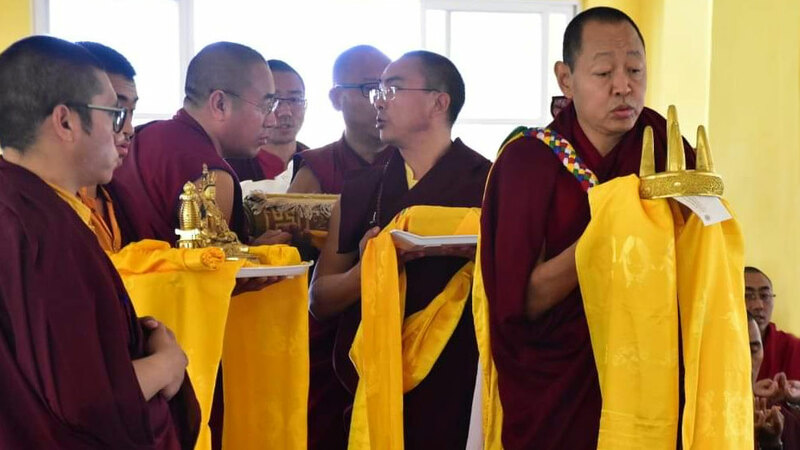 It’s an opportunity to serve the Buddha Dharma and indeed a great pride to Mindrolling lineage for choosing His Holiness the 9th Minlling Khenchen Rinpoche as an instructor for this grand association. 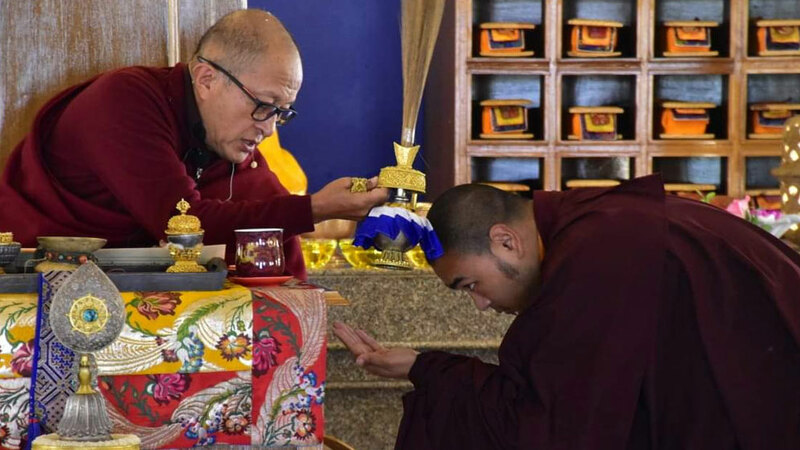 May the Buddha Dharma grow to its highest possible dimension and may all sentient beings get benefit.